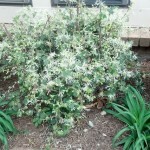 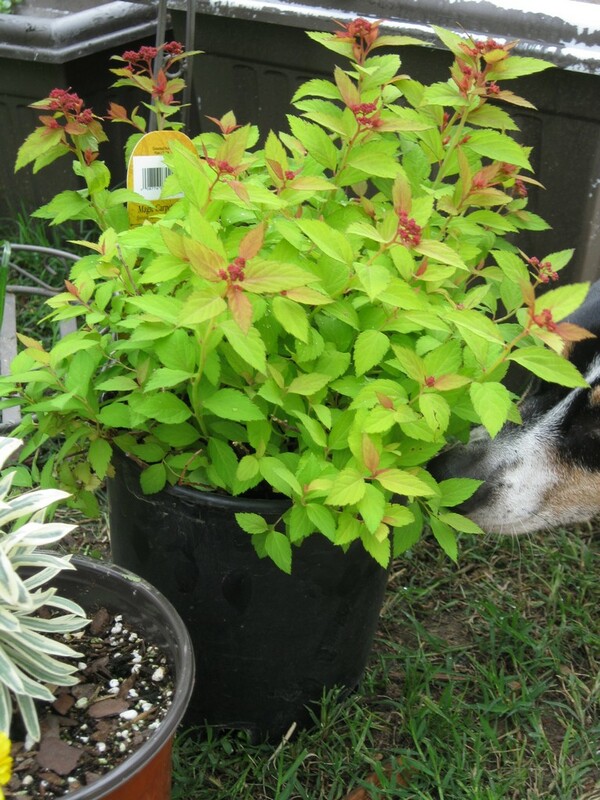 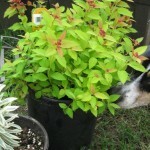 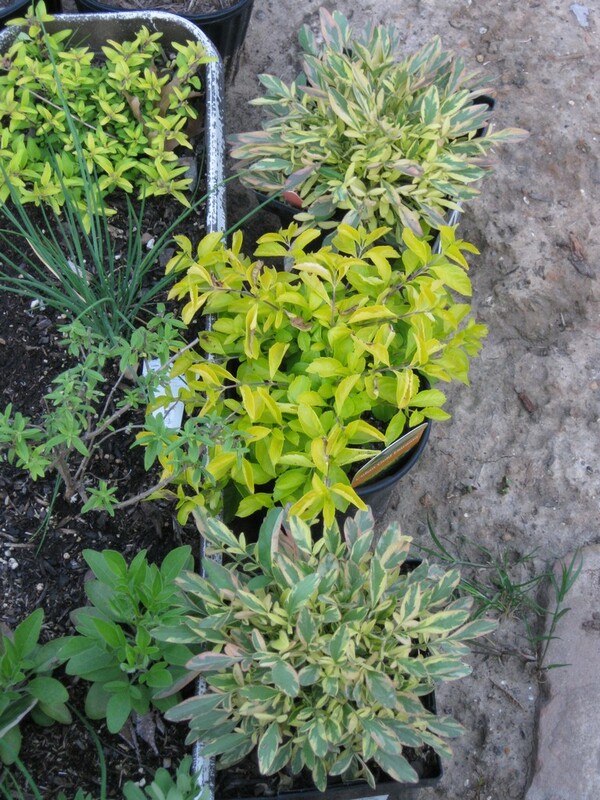 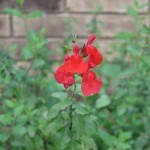 Wishlish plant of the day: Malvaviscus candida Variegata or Variegated Turk’s Cap (a shade plant for Texas)! 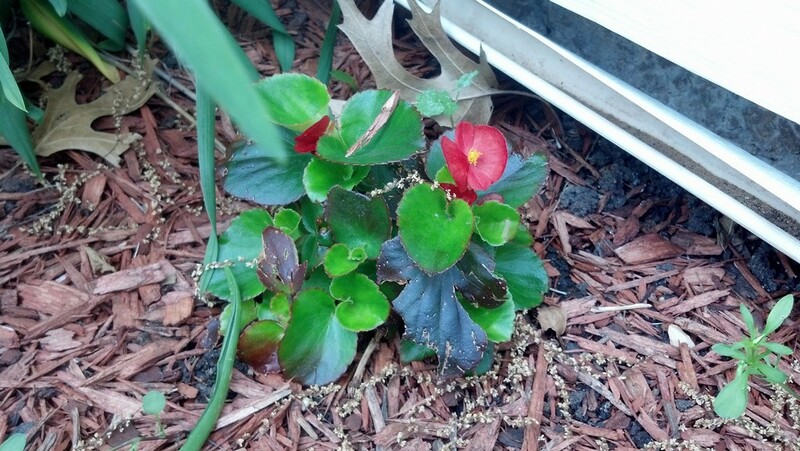 First stop is the planter box by the patio door. 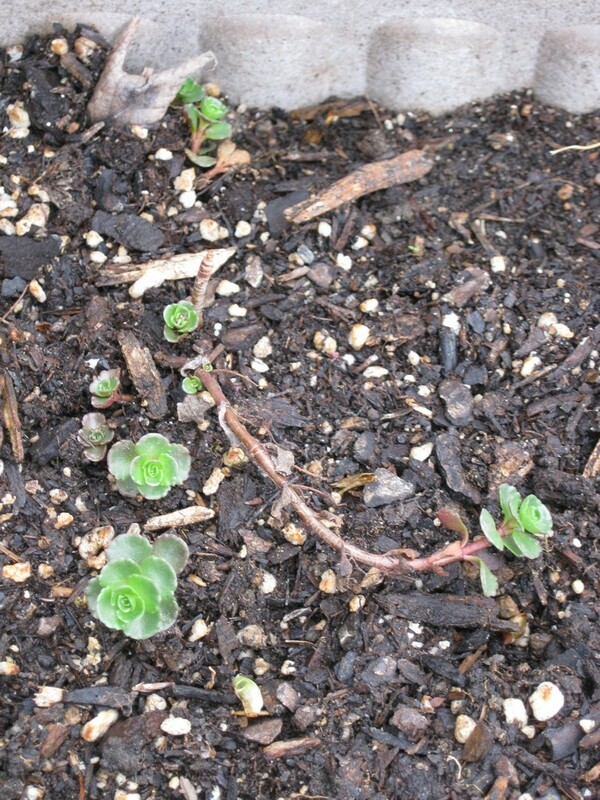 I dropped some cuttings of stonecrop (?) 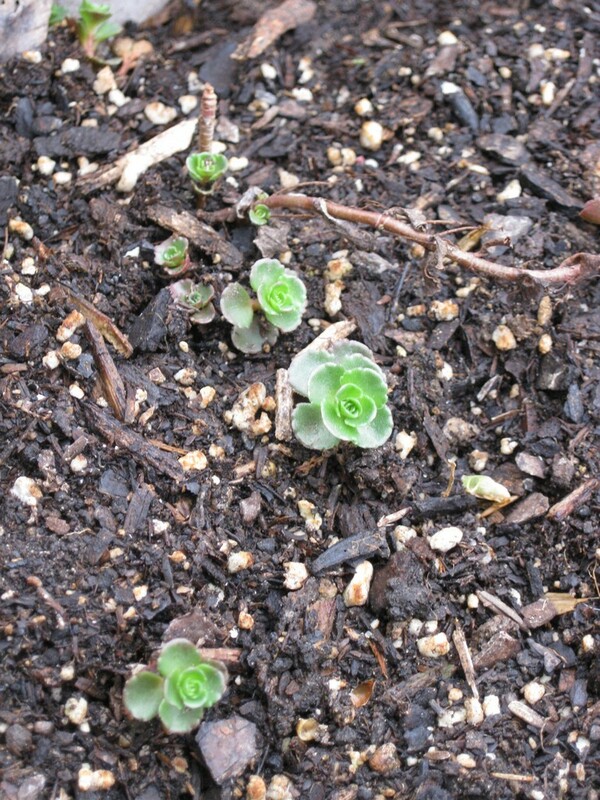 that I took while trimming my succulent planter. 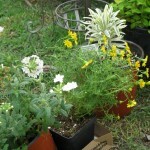 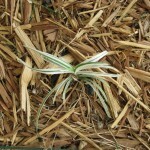 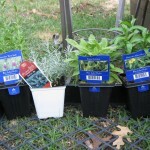 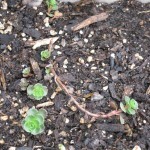 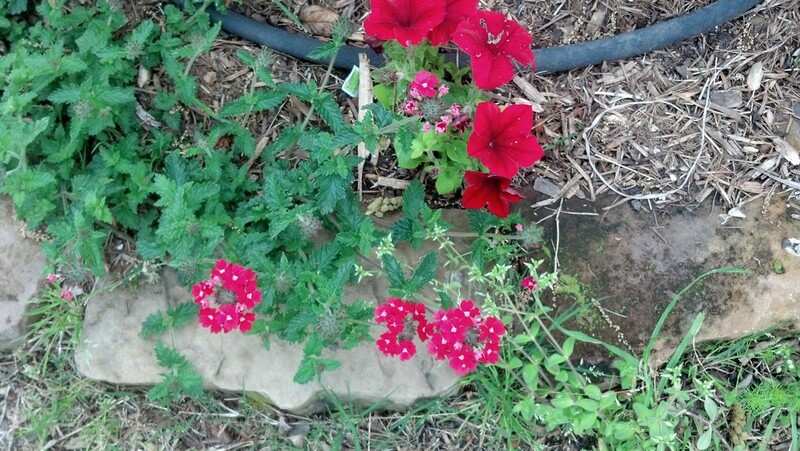 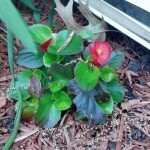 I didn’t have high hopes that these stray cuttings would flourish, but they look pretty alive in that dirt, don’t they? 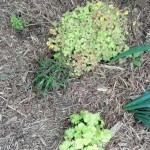 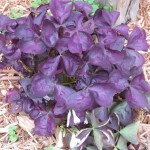 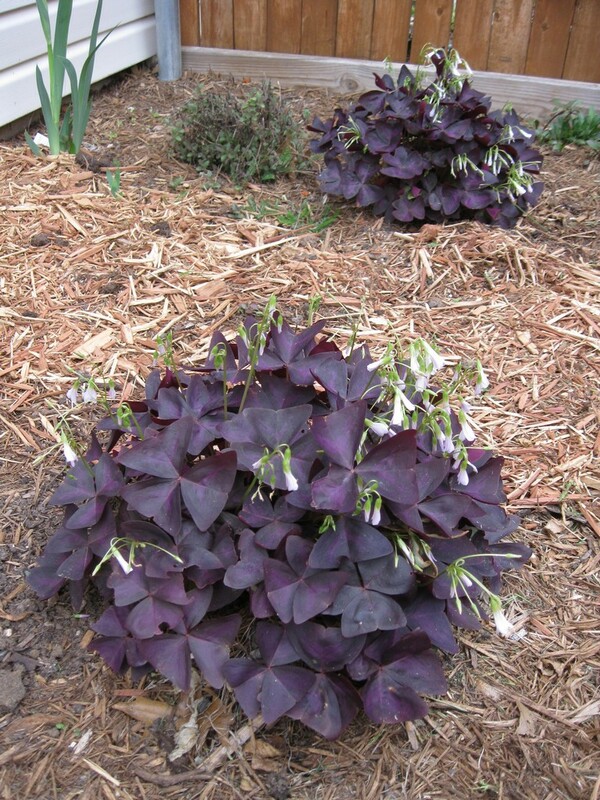 The oxalis in the blue bed appear lush and full. 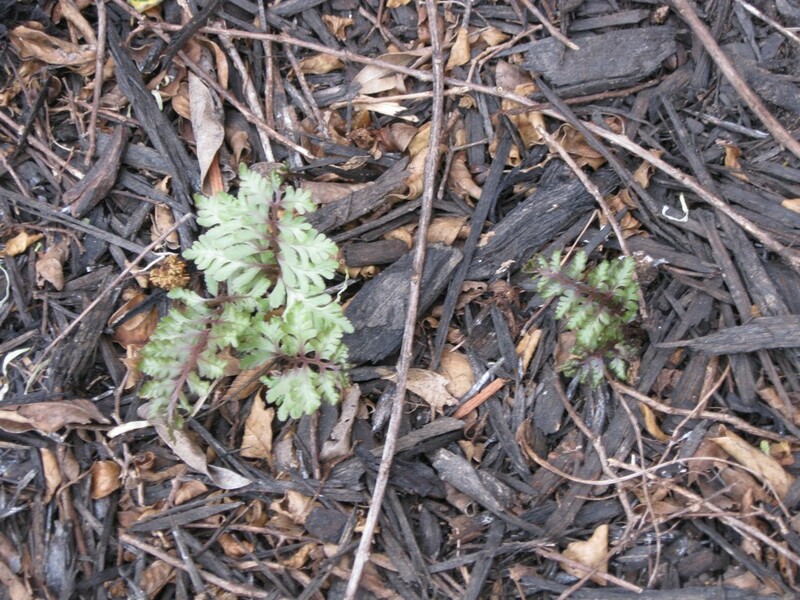 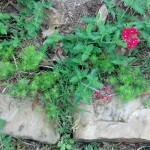 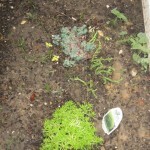 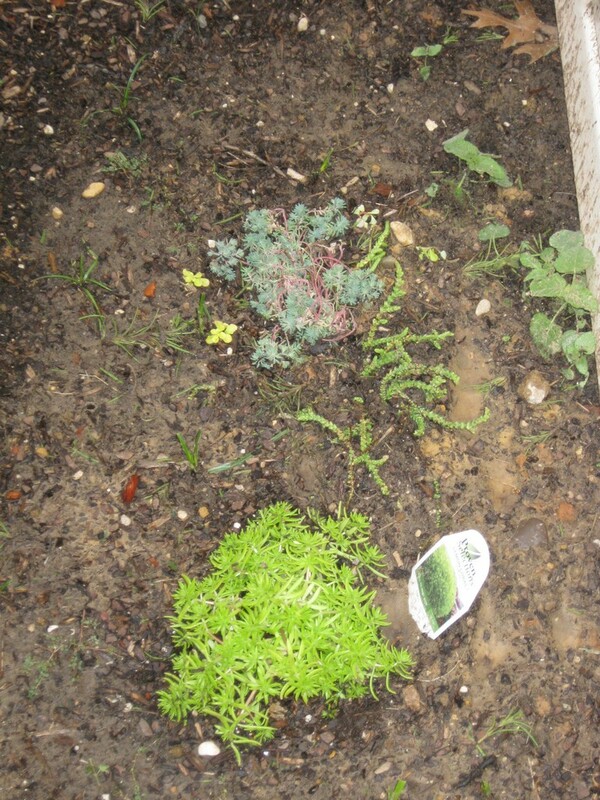 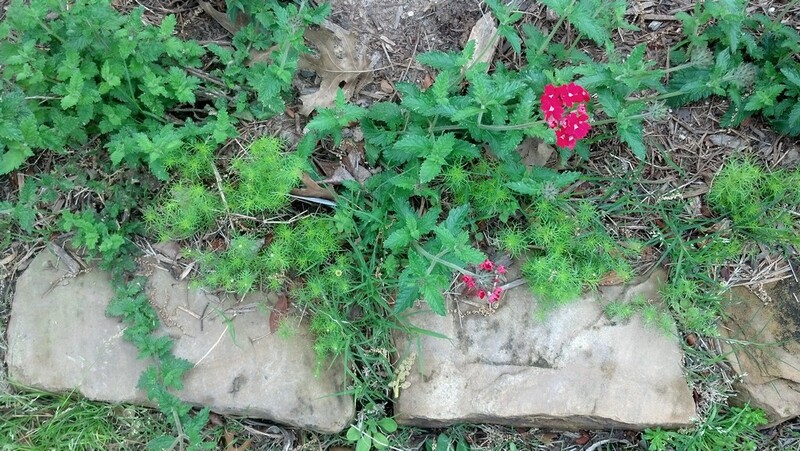 Notice the remnants of the yarrow I pulled out a couple of weeks ago lying in wait to take over. 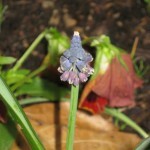 I am baffled by these rosettes in the blue bed. 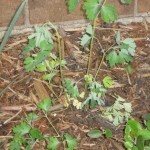 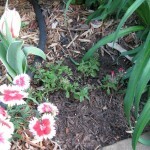 These are the surviving Blue Knoll Chrysanthemums, aka Heteropappus Meyendorfii. 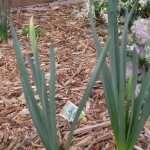 They are reportedly annual, but these two are starting their second year in this bed. 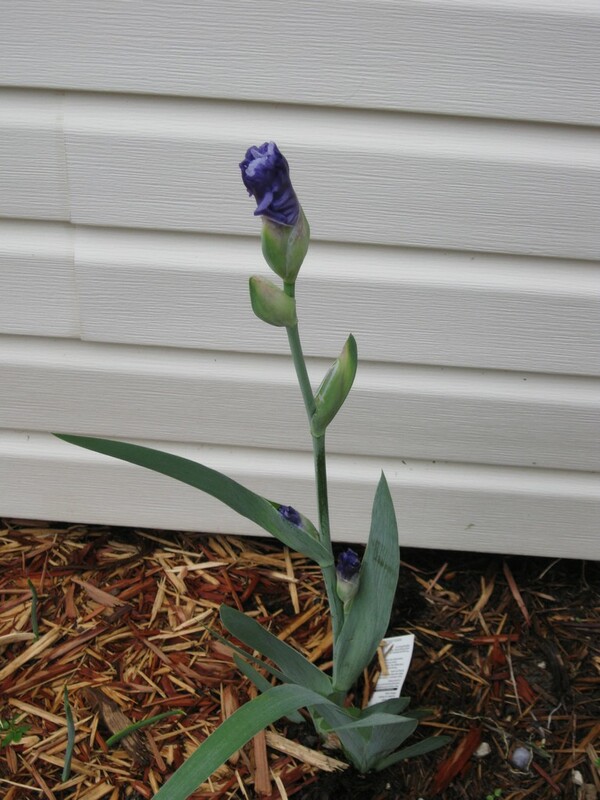 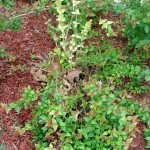 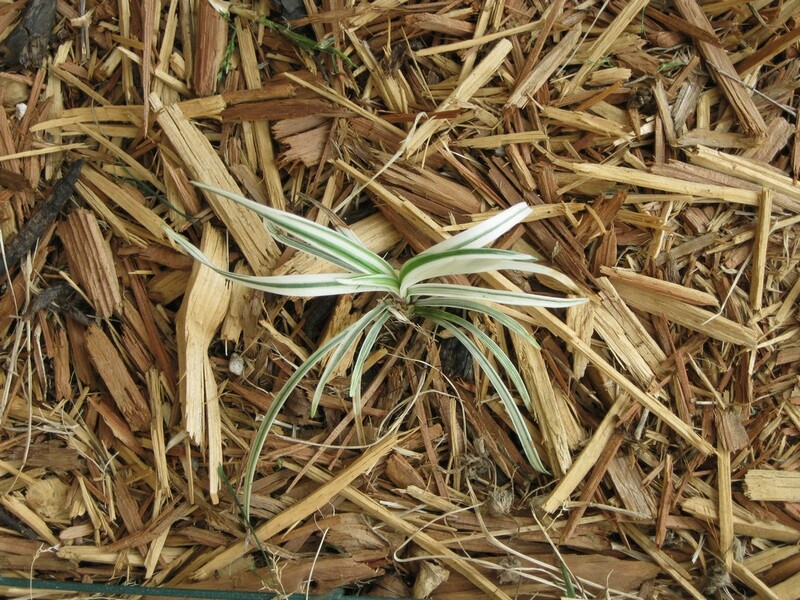 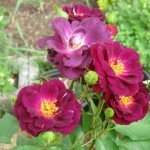 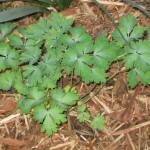 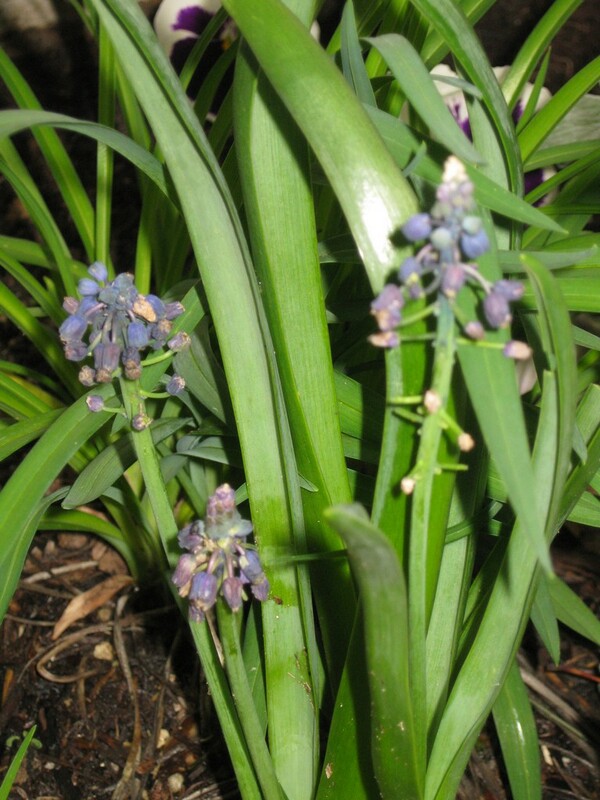 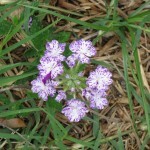 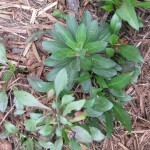 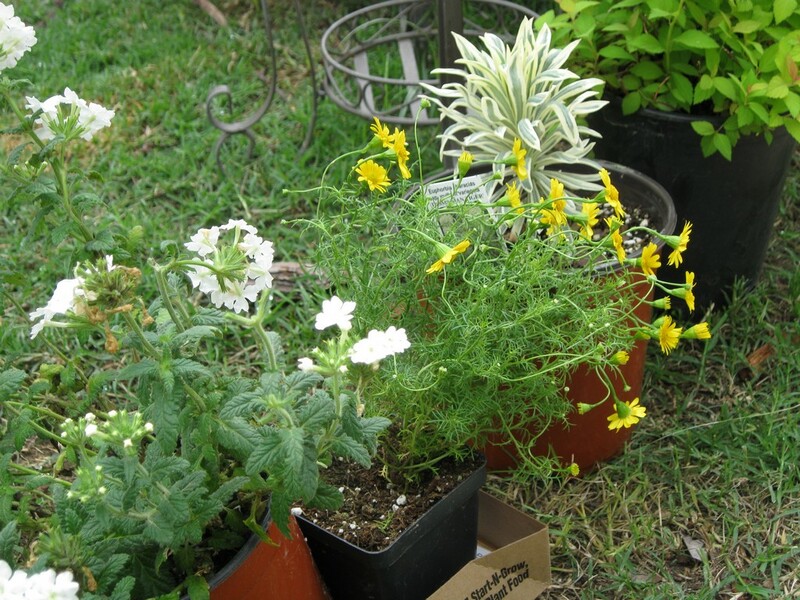 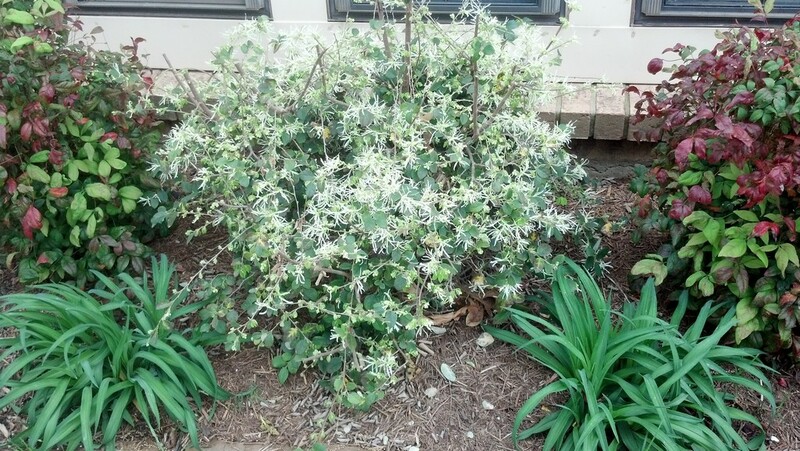 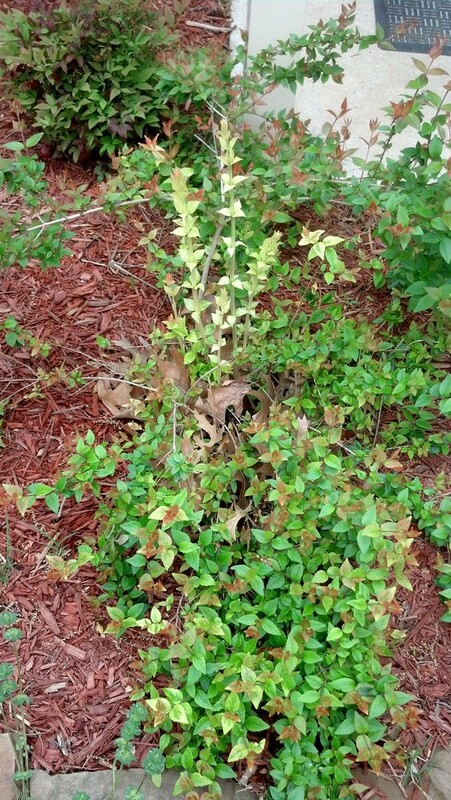 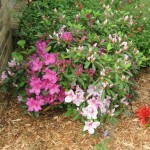 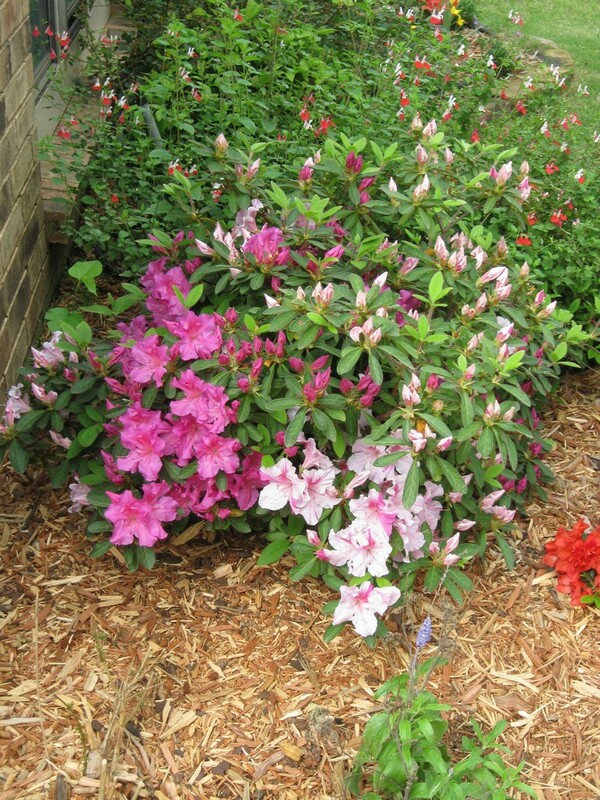 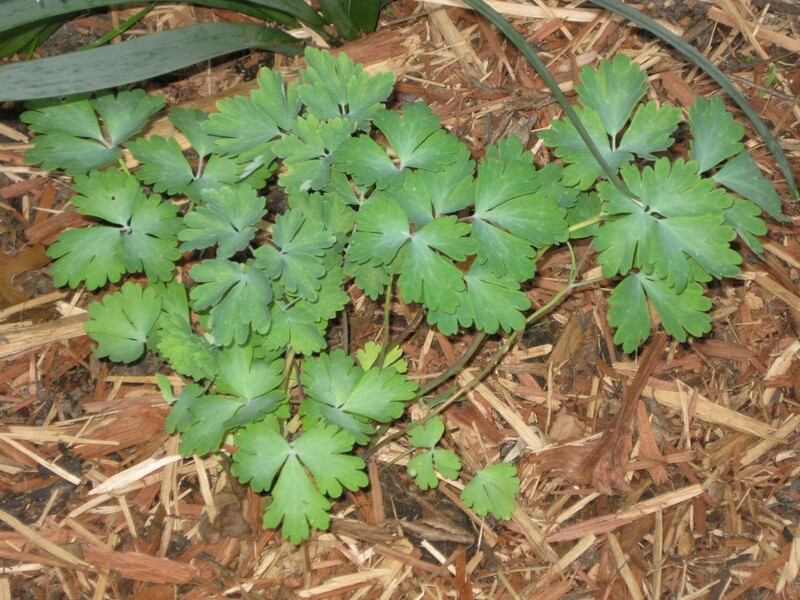 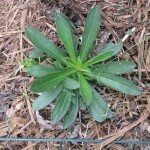 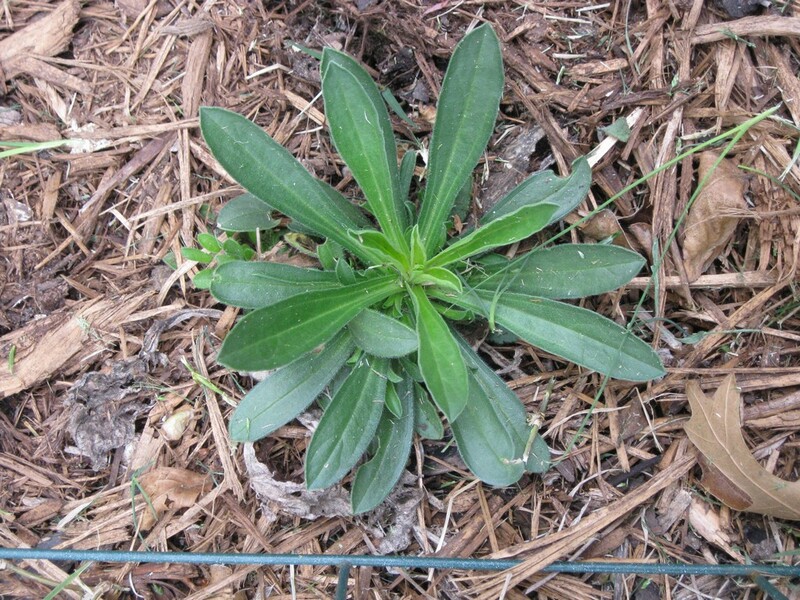 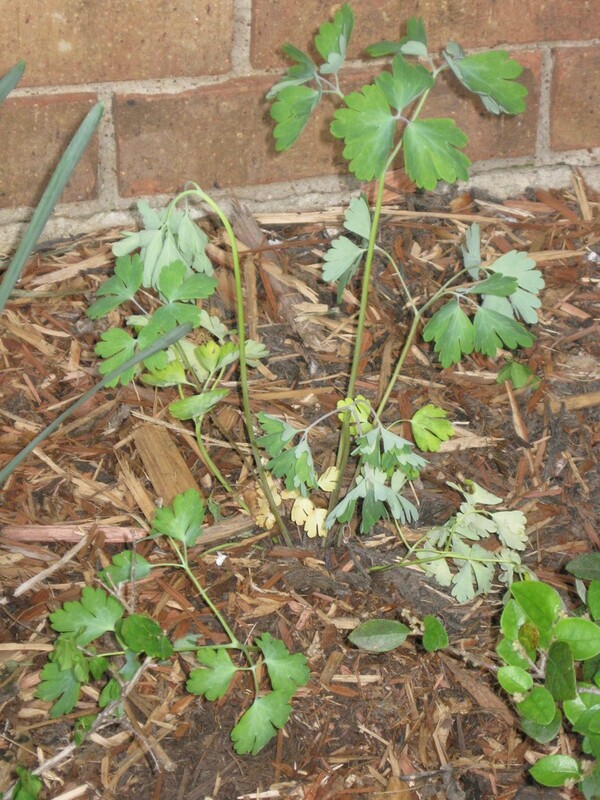 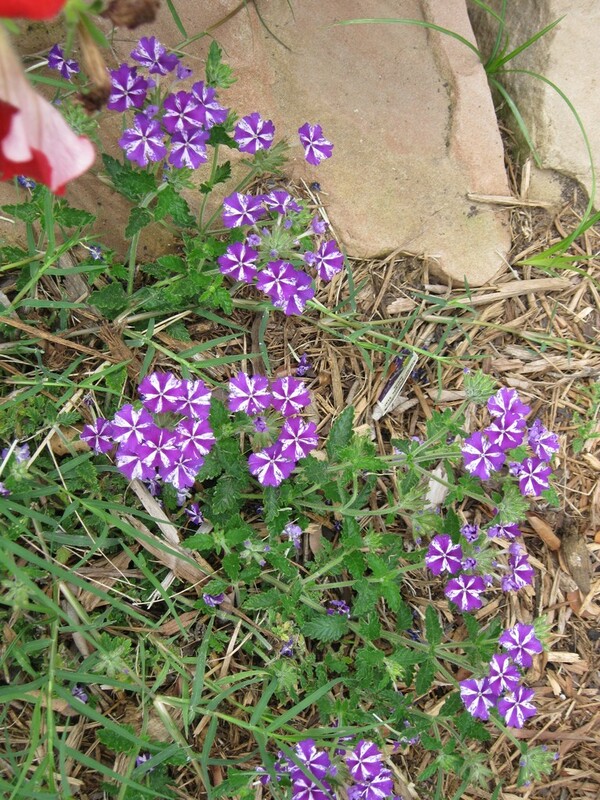 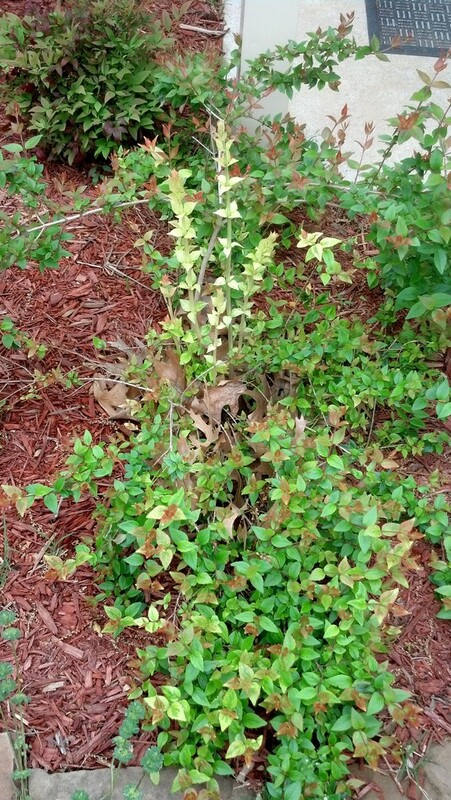 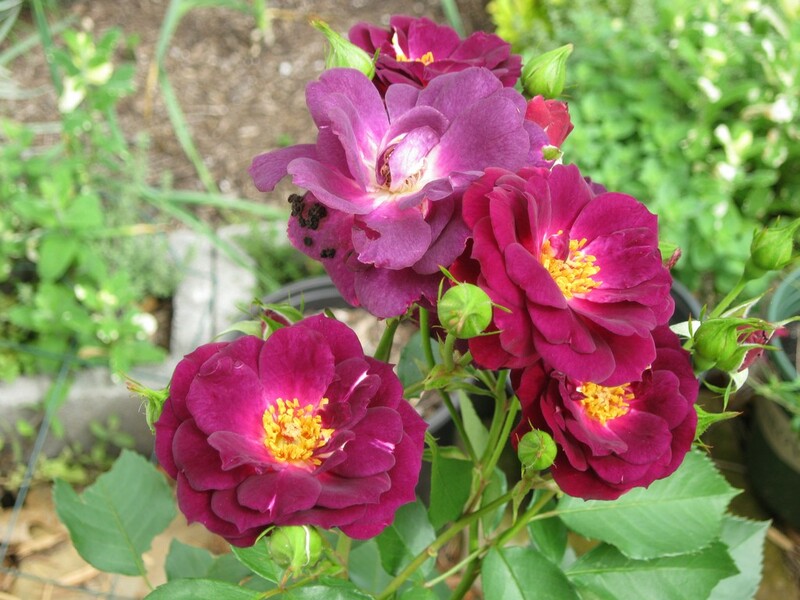 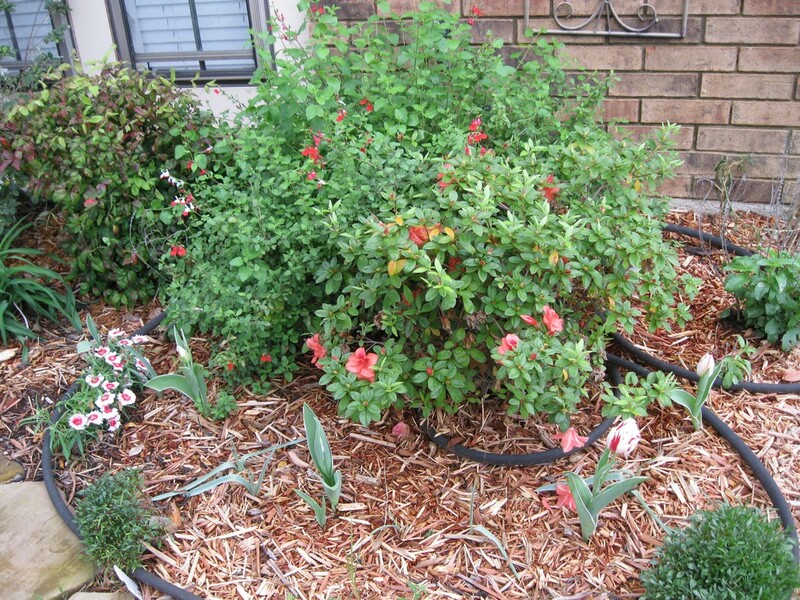 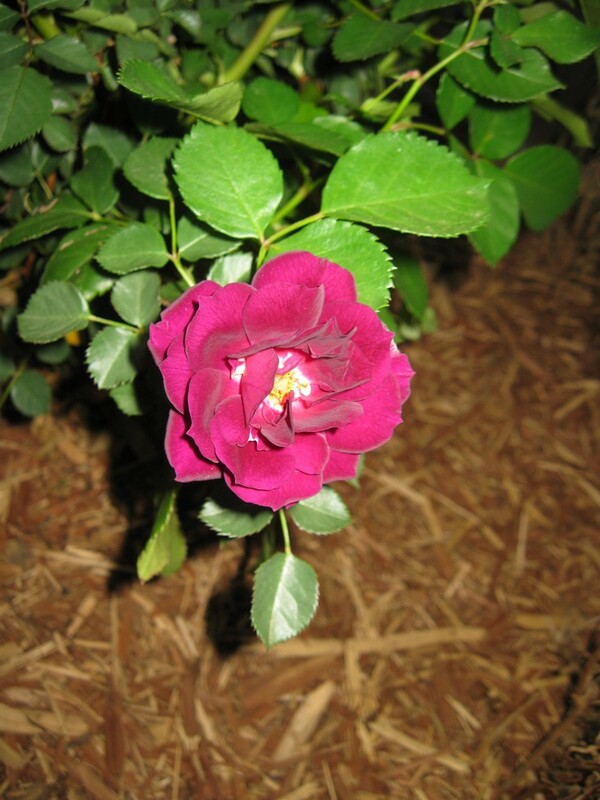 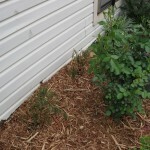 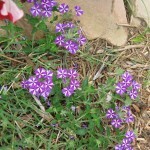 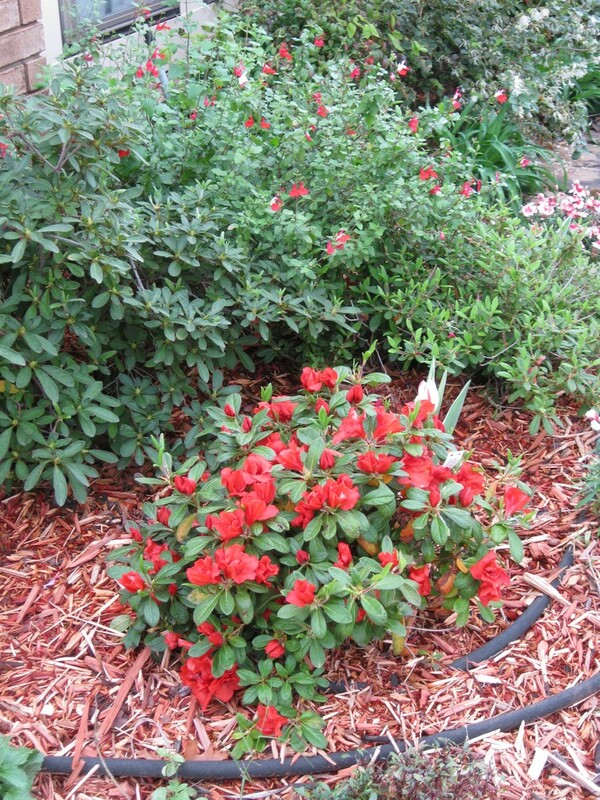 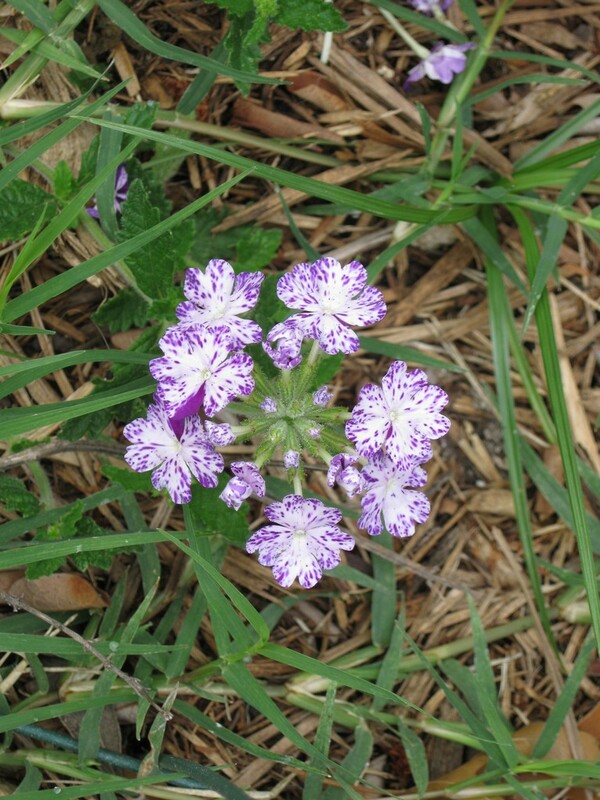 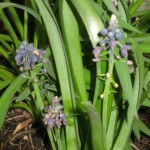 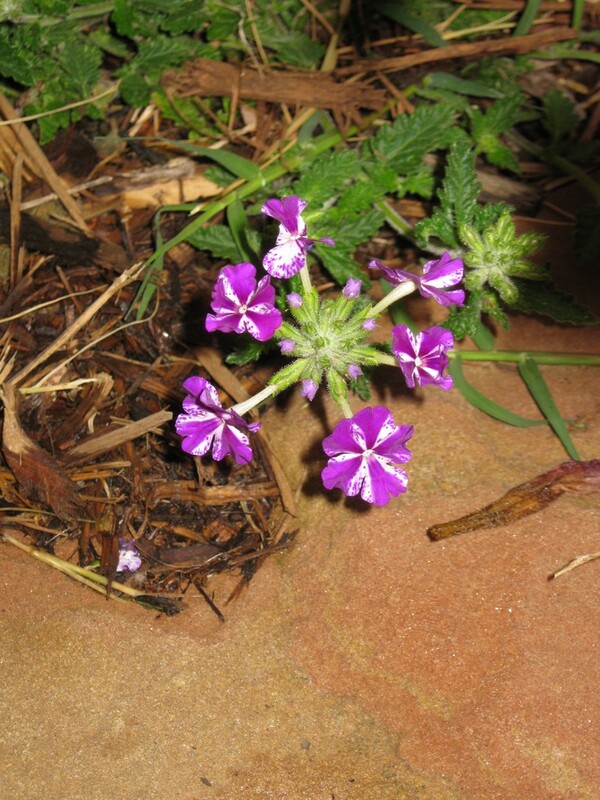 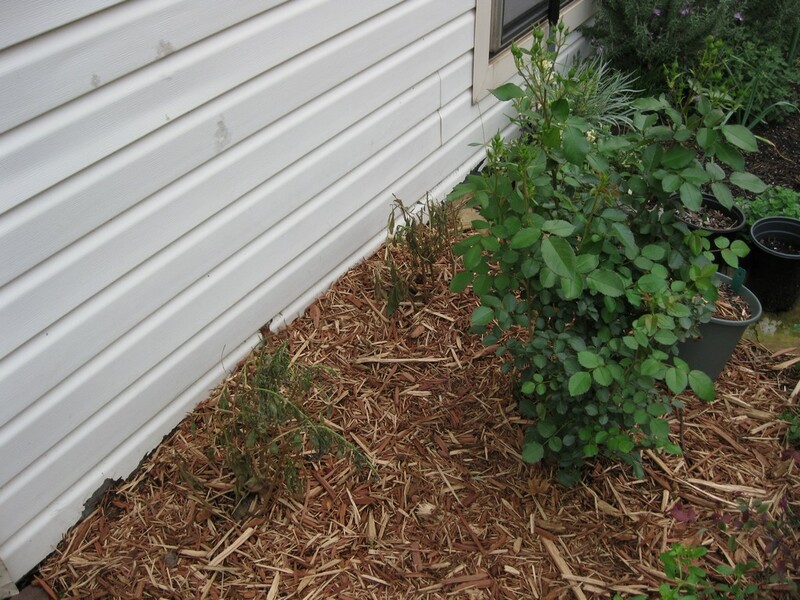 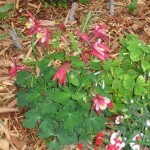 They sat in mulch, tolerating dry-to-drought conditions, part sun and displayed no flowers last fall. 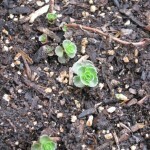 They have not grown beyond the size they currently are. 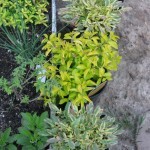 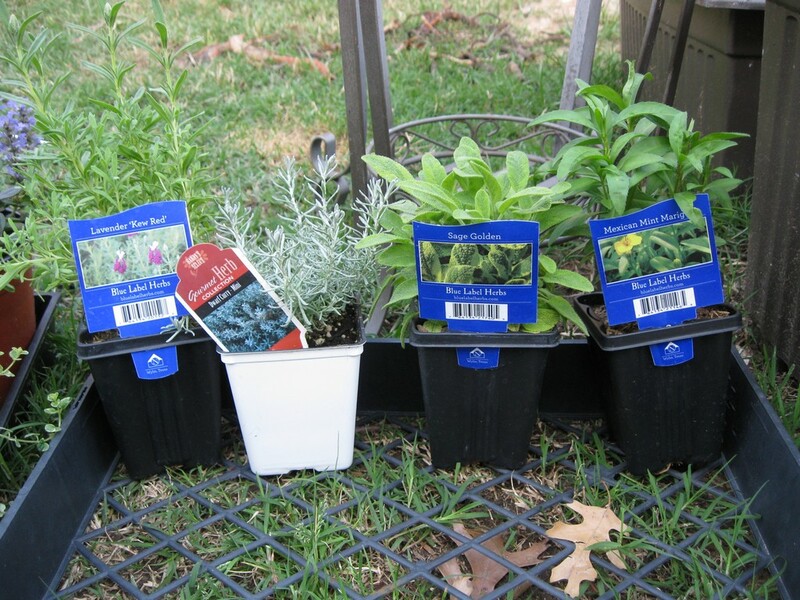 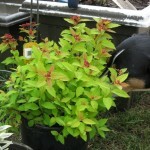 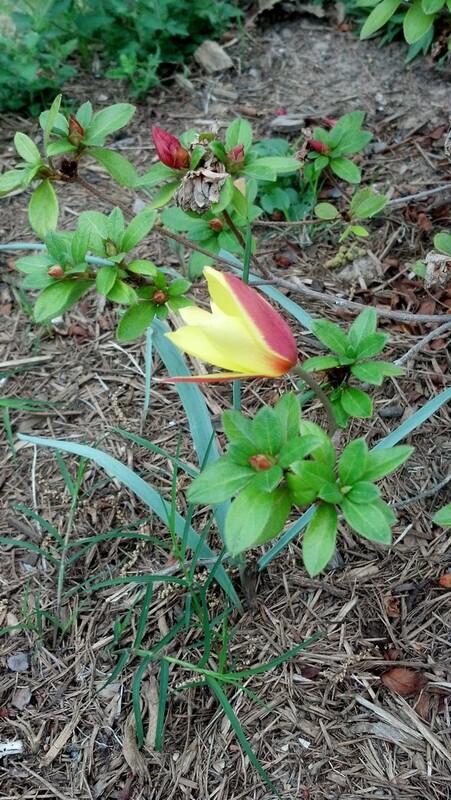 Is there a chance that these might provide some autumn color this year? 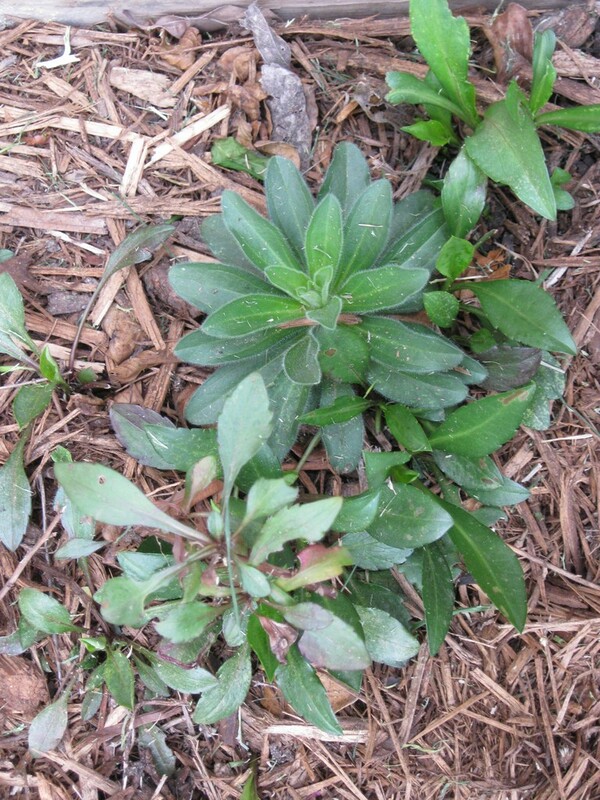 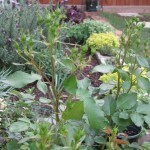 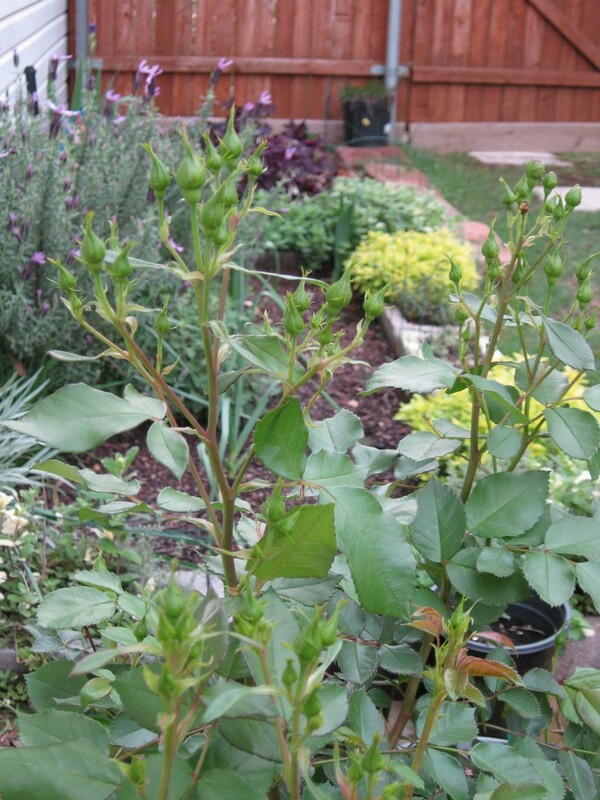 I’m going to have to pull out the Days Aster–it spreads everywhere and has invaded the camellia bed on the other side of the fence. 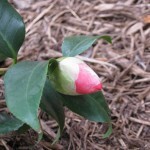 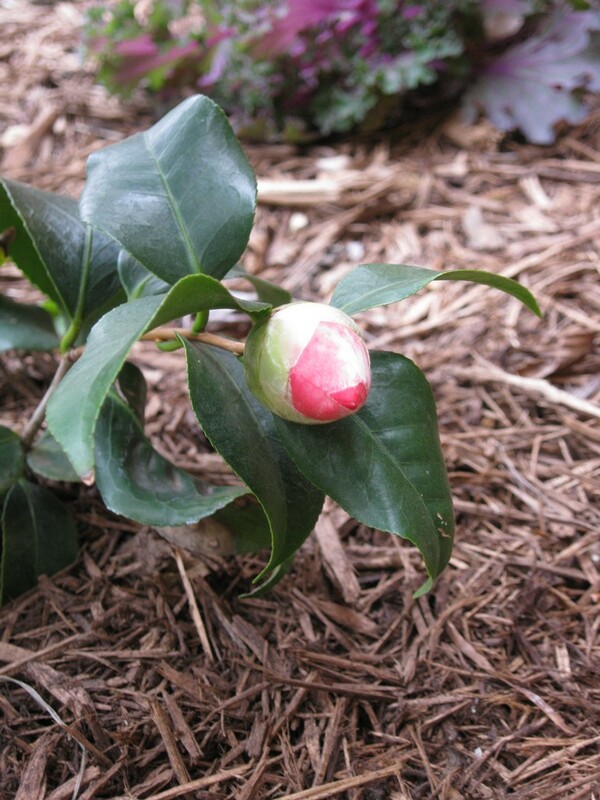 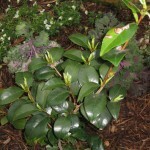 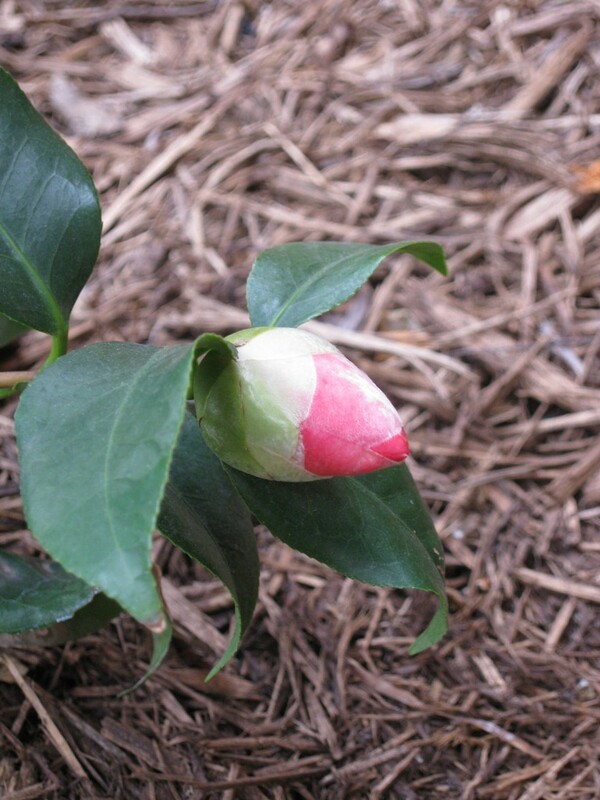 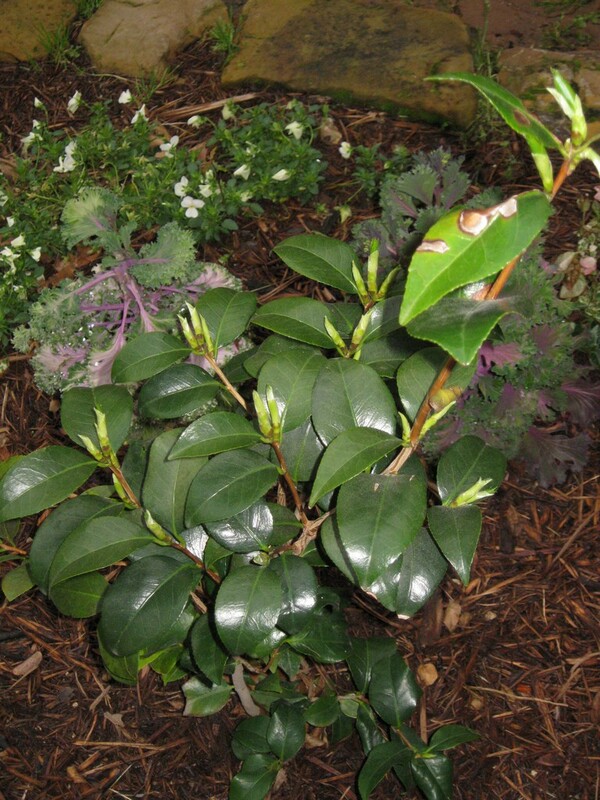 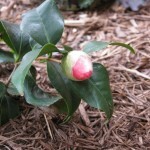 The next camellia bud is about to burst. 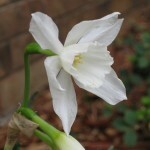 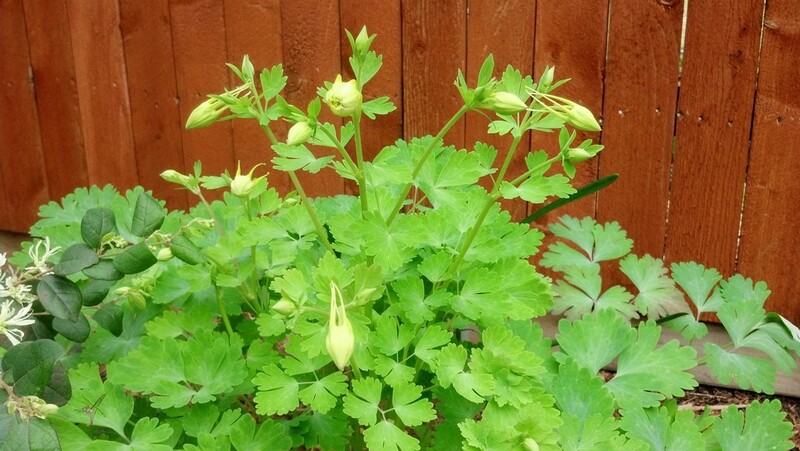 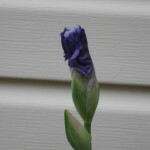 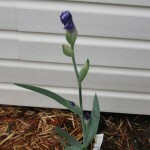 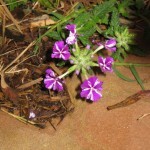 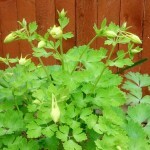 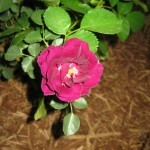 This particular bloom occurs very low on the plant and to the back. 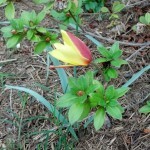 It requires some position to take it in full view. 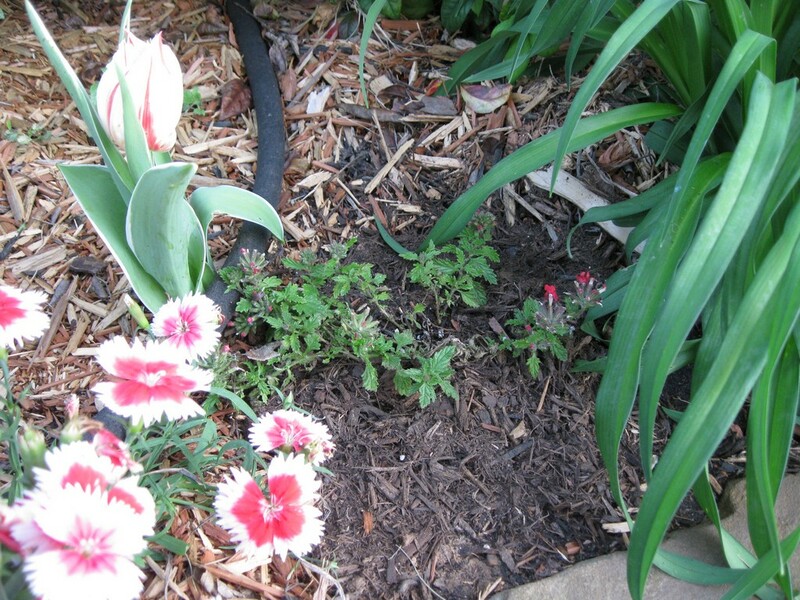 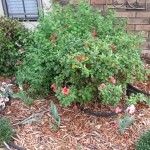 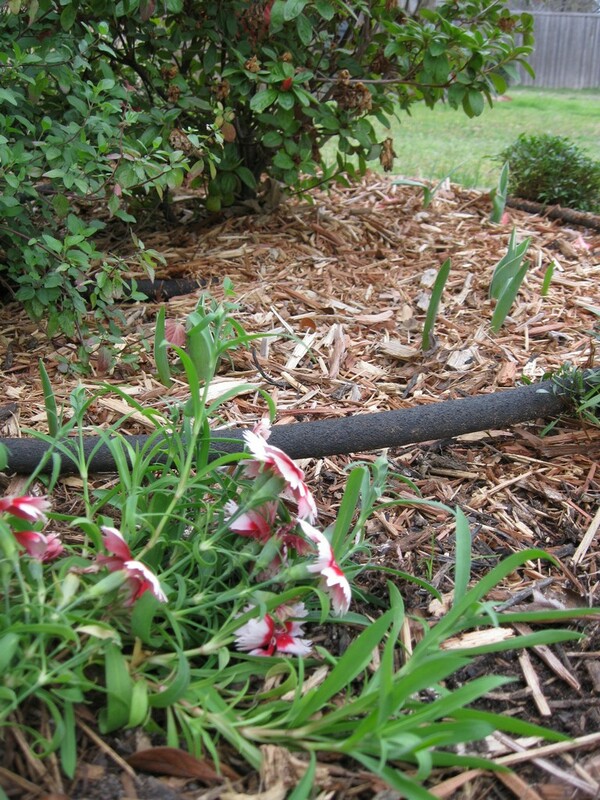 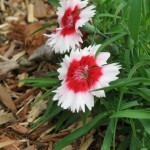 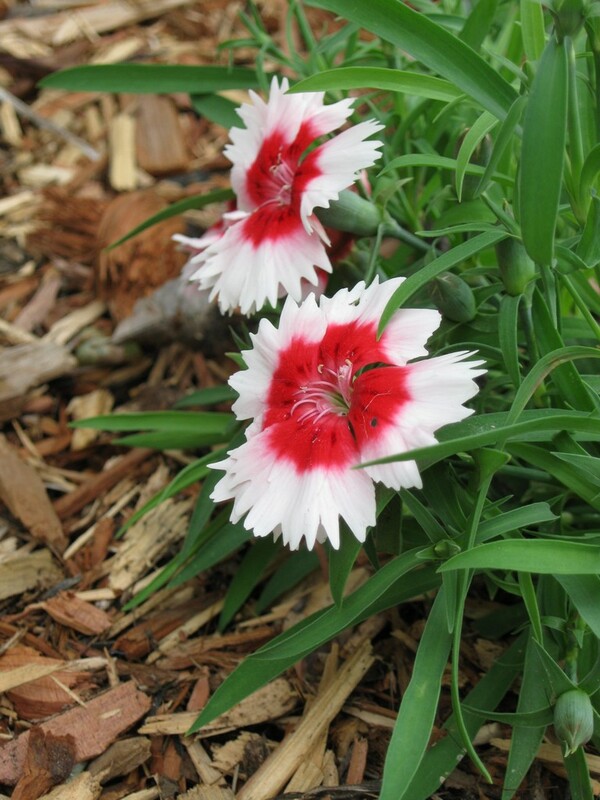 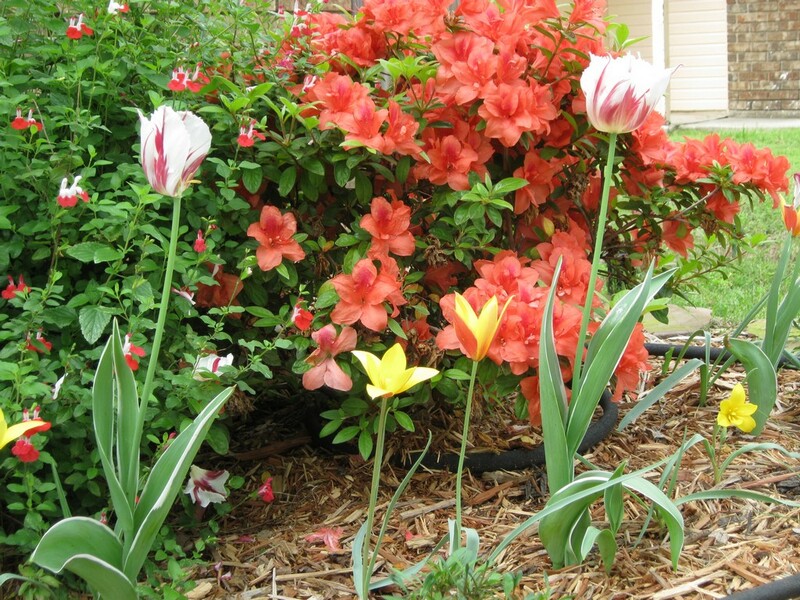 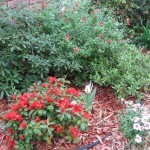 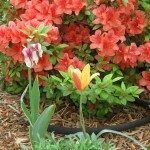 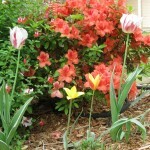 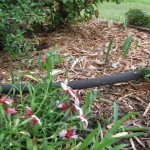 Front flower bed: tulips bursting out of the mulch and the newly transplanted Valentine dianthus. 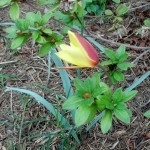 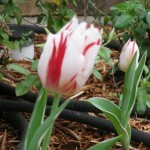 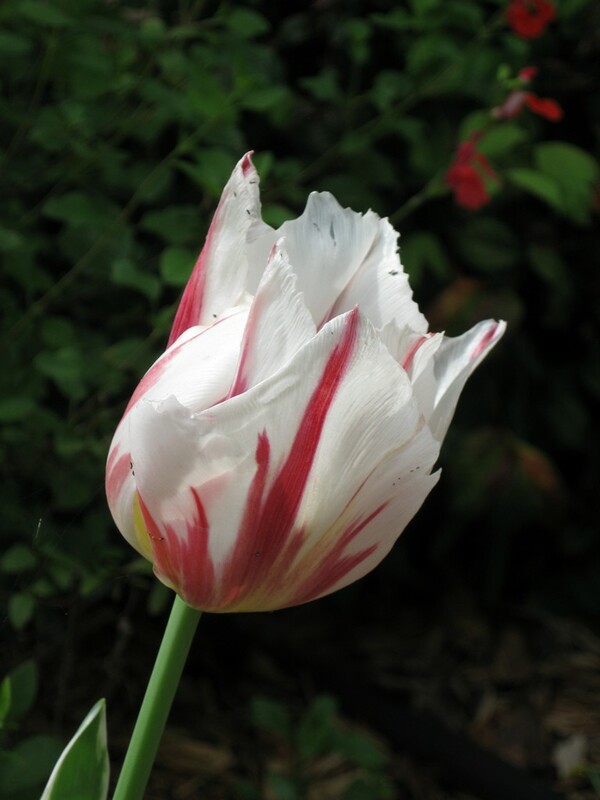 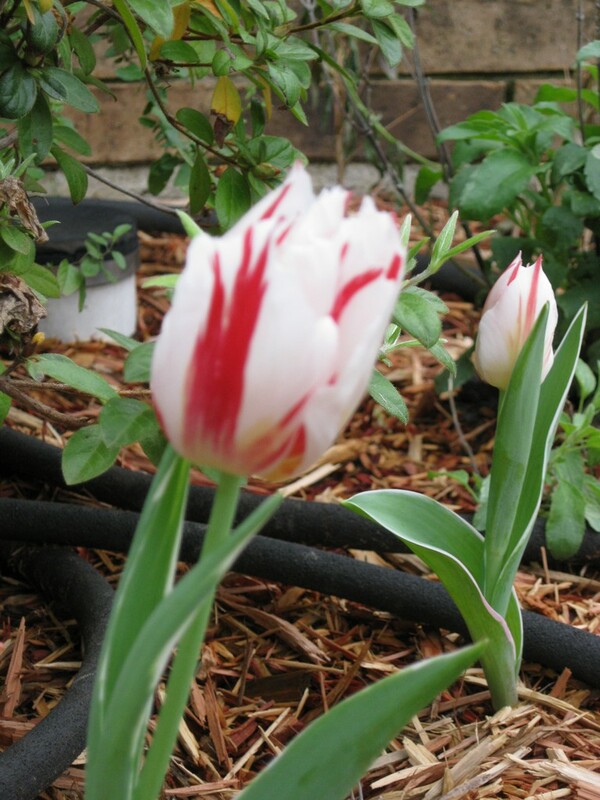 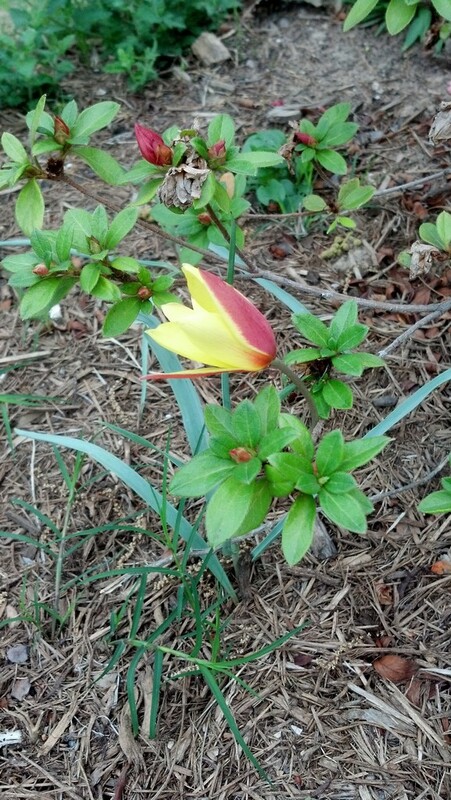 Notice the white edging on the tulip leaves; this appears to be the Happy Generation tulip planted last fall. 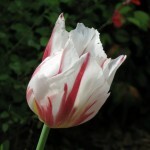 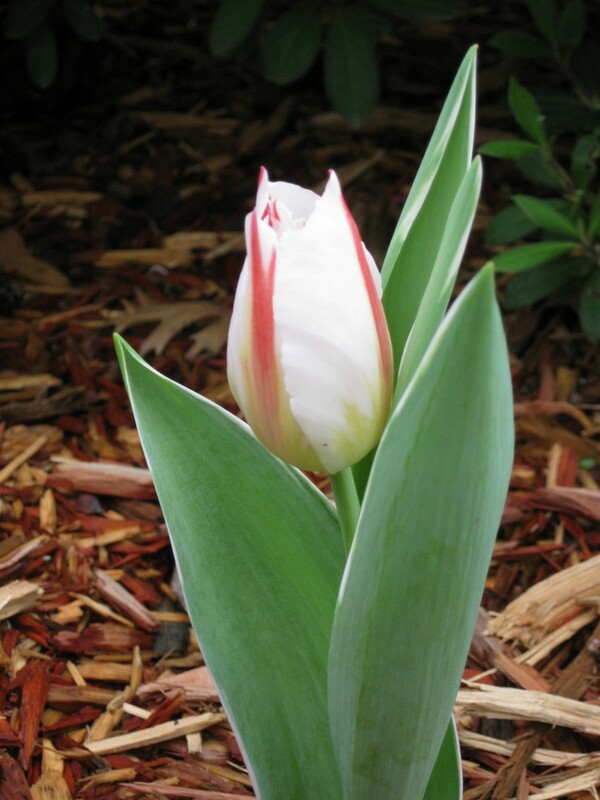 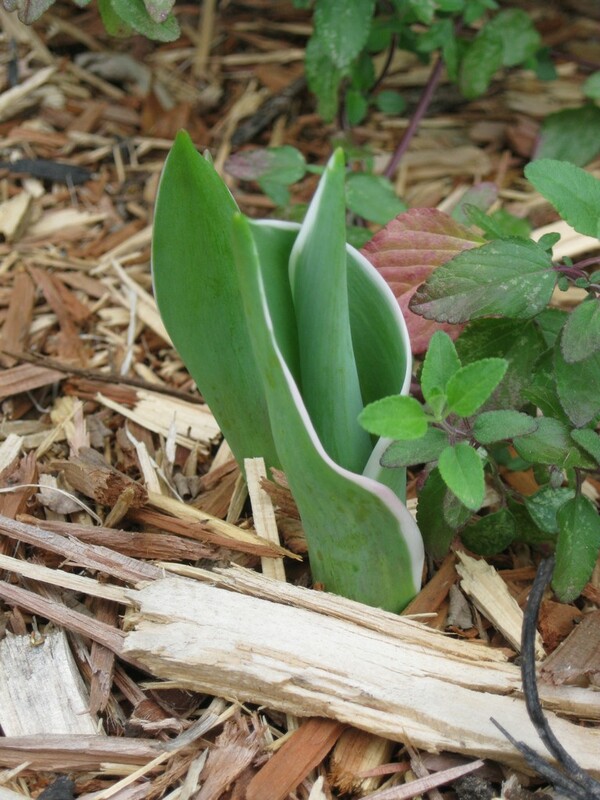 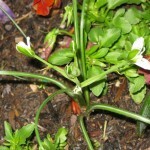 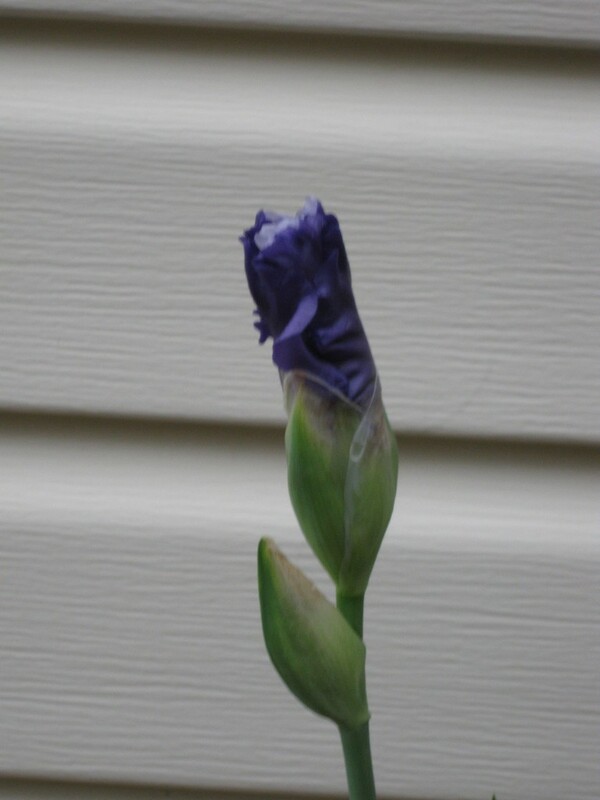 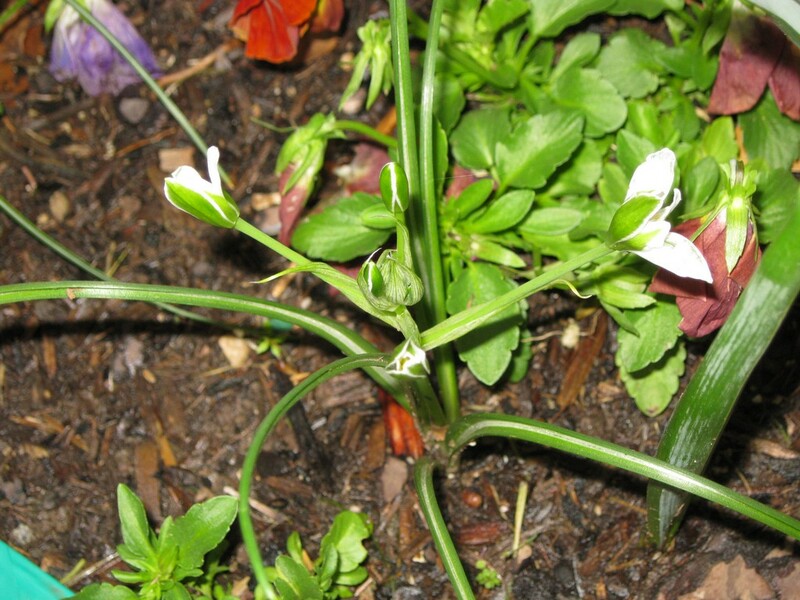 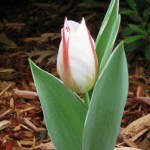 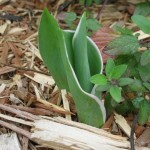 The other tulip sprouts are smaller and do not display edging; most likely they are Tubergen’s Gem. 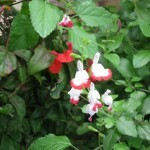 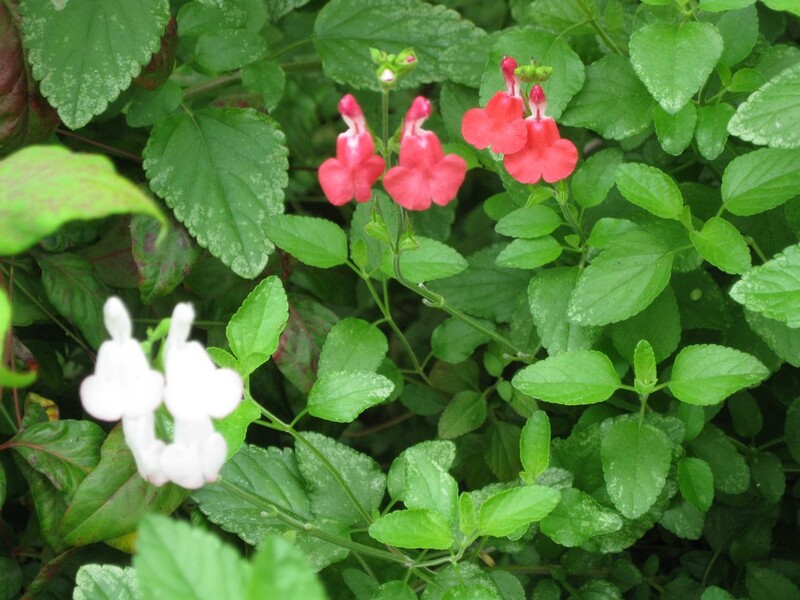 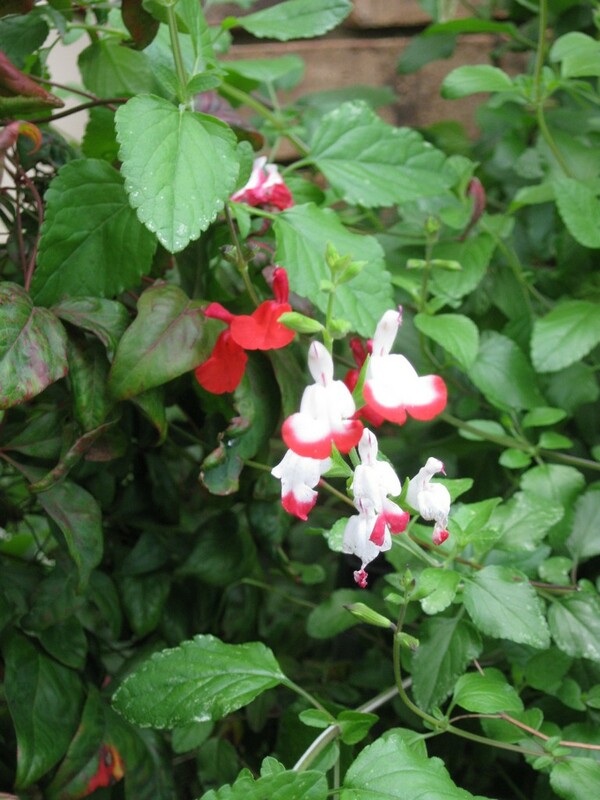 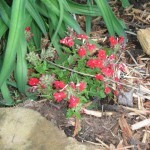 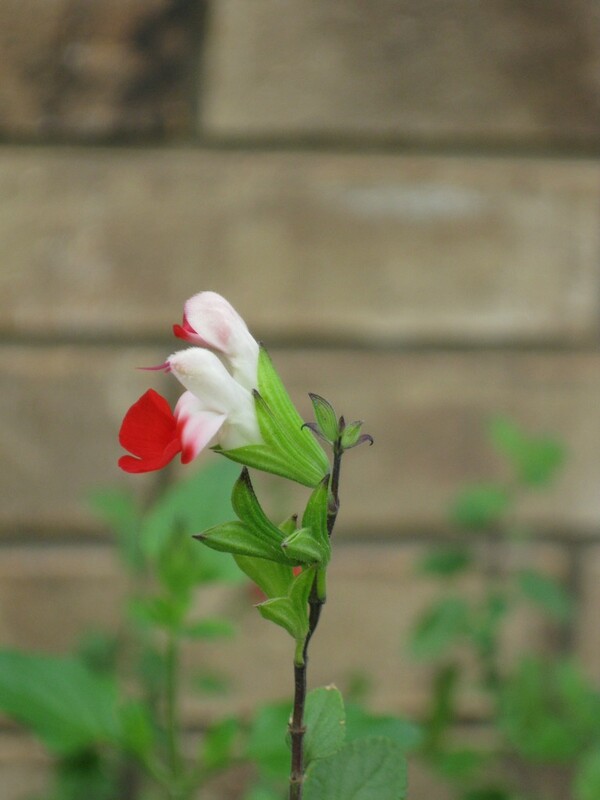 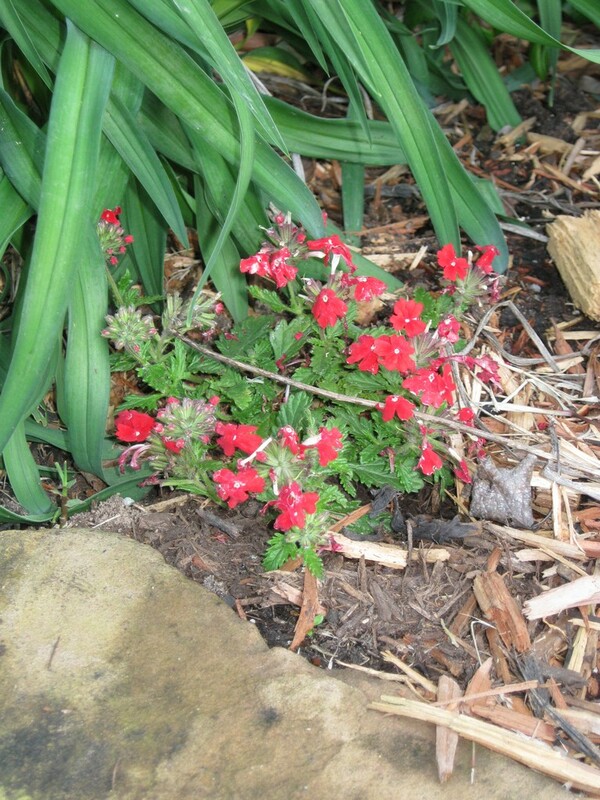 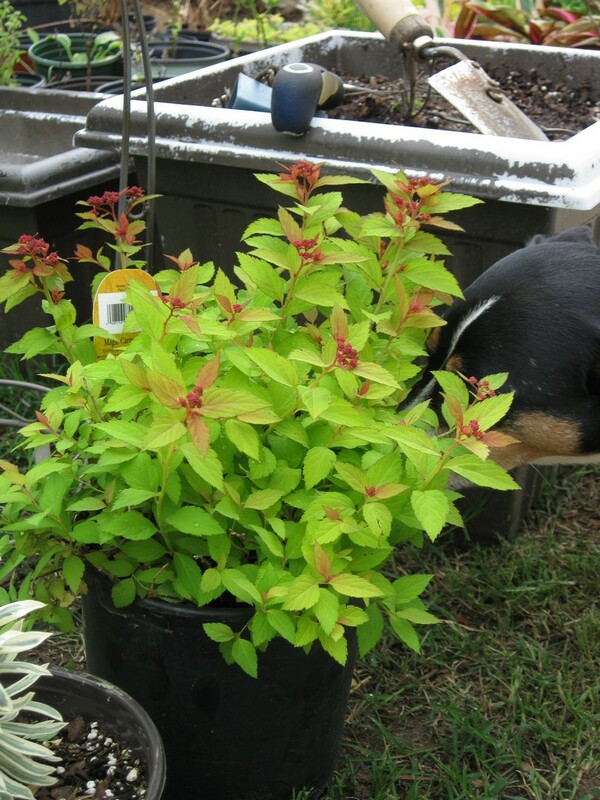 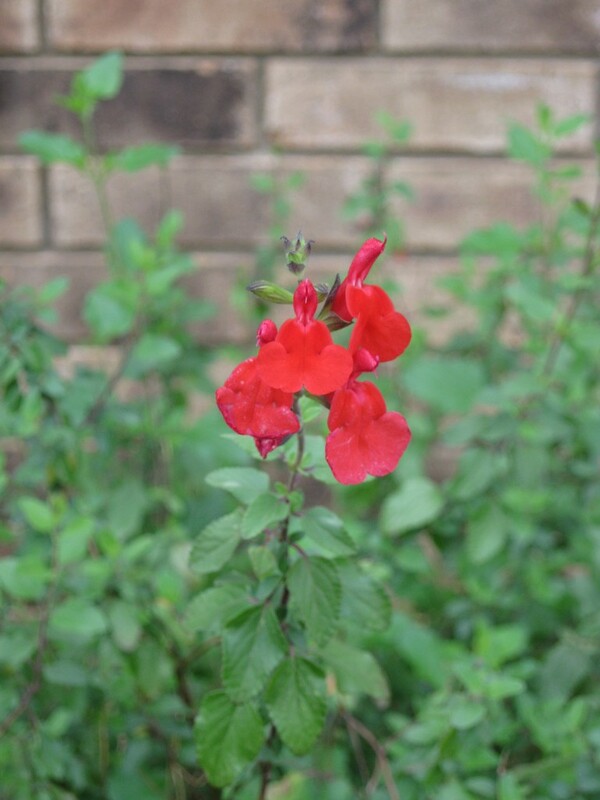 Hot Lips salvia starting out with red blooms, but the bicolor blooms are coming on fast. 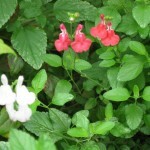 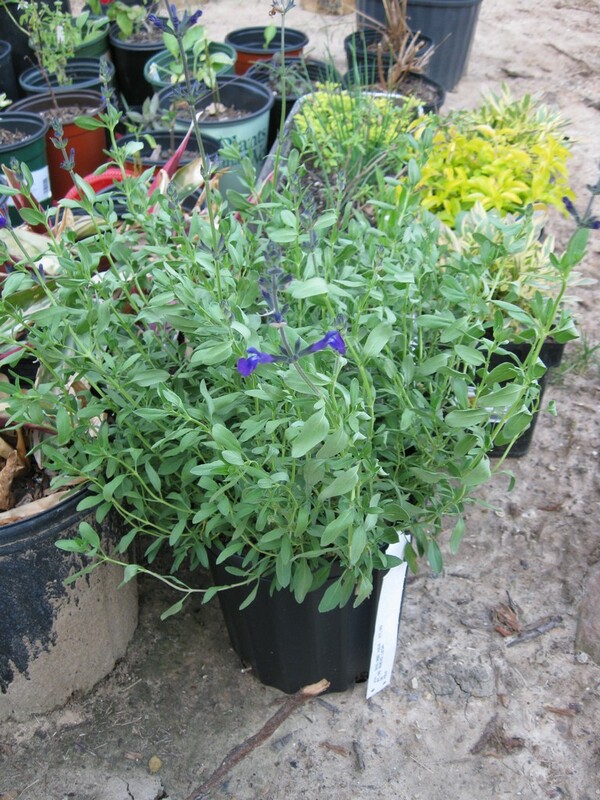 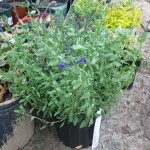 I just love the variability of this salvia. 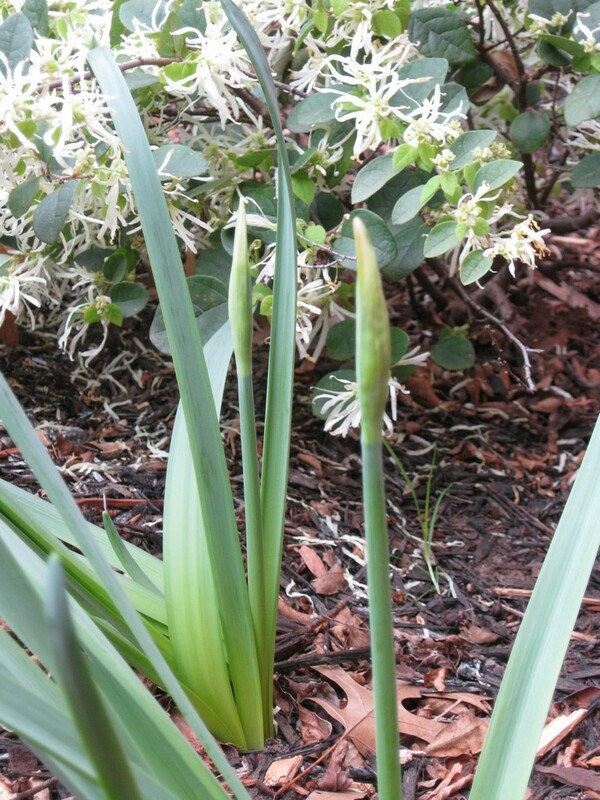 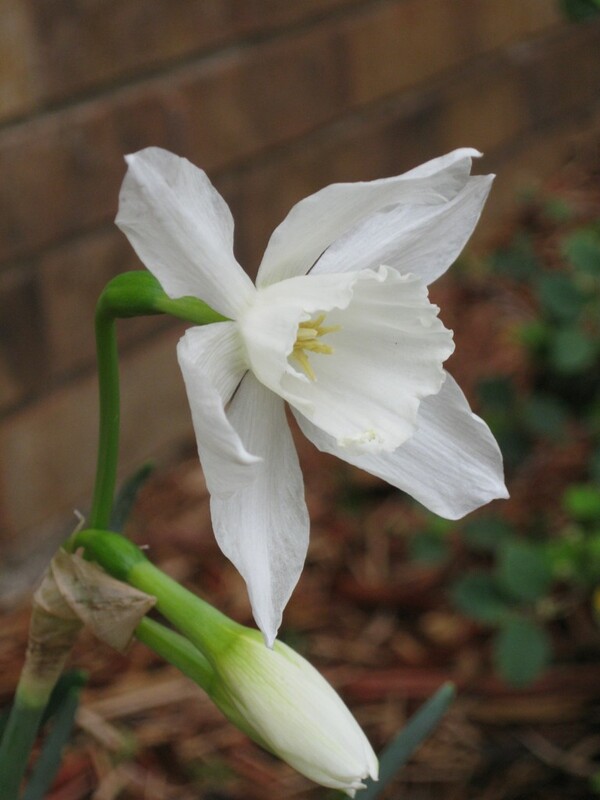 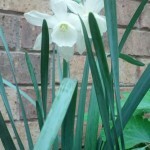 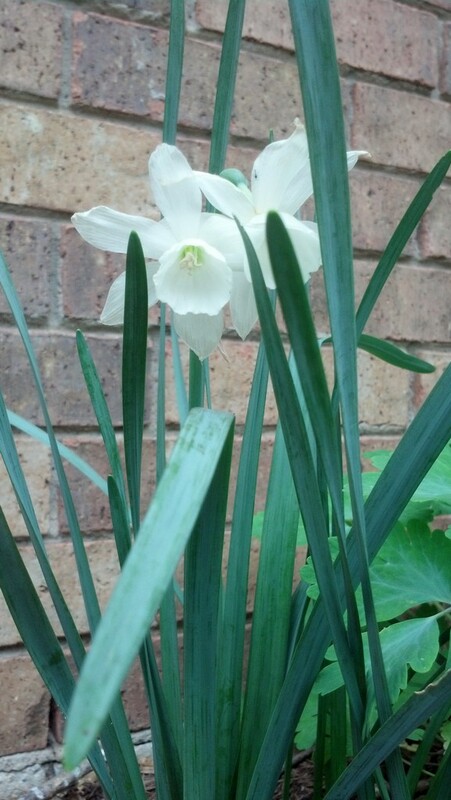 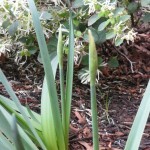 Daffodil buds have appeared. 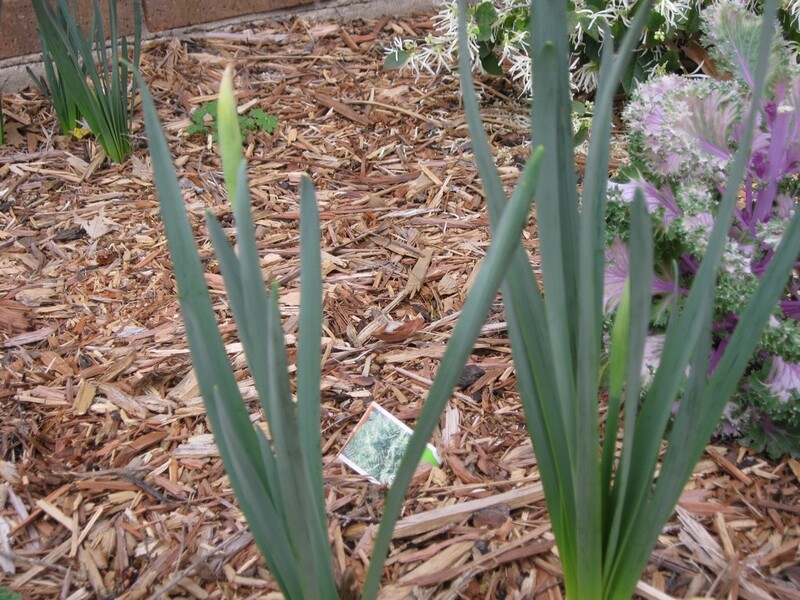 I expect to see them bloom in a matter of days. 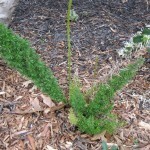 This particular foxtail fern has new plumes. 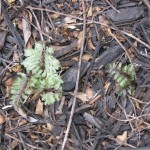 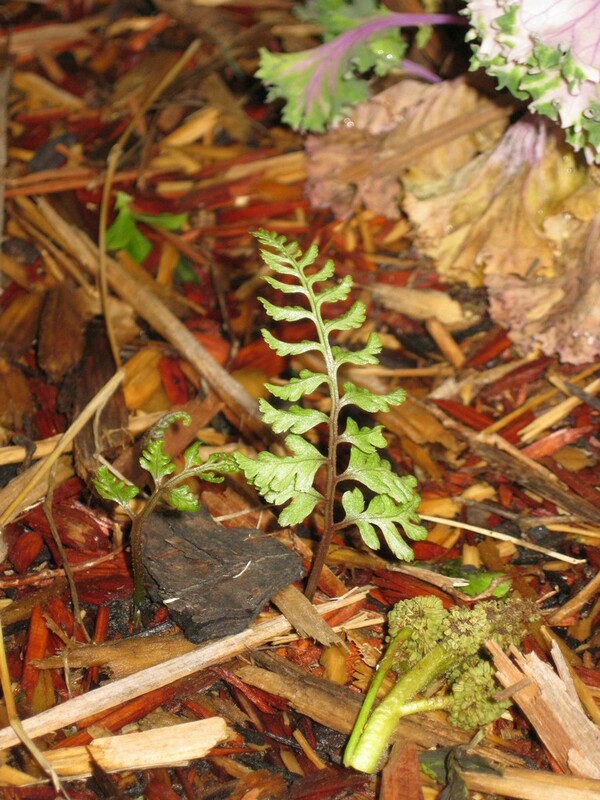 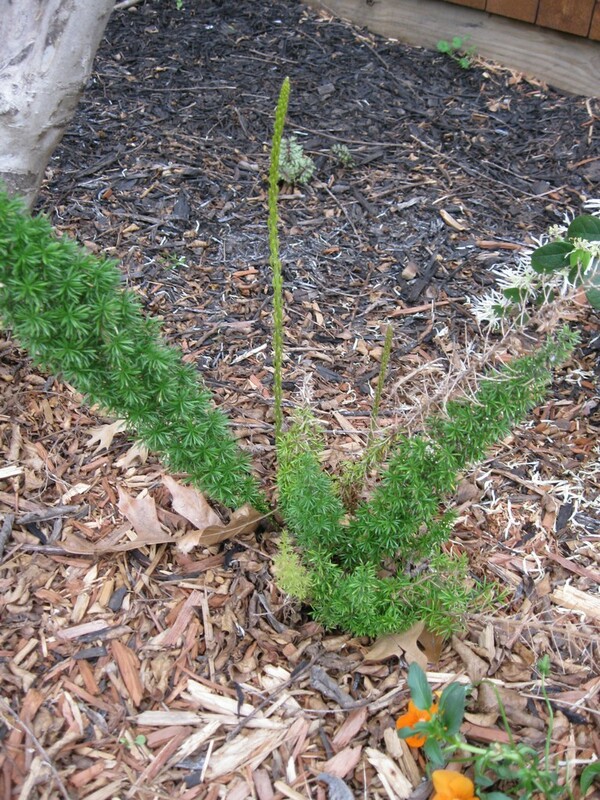 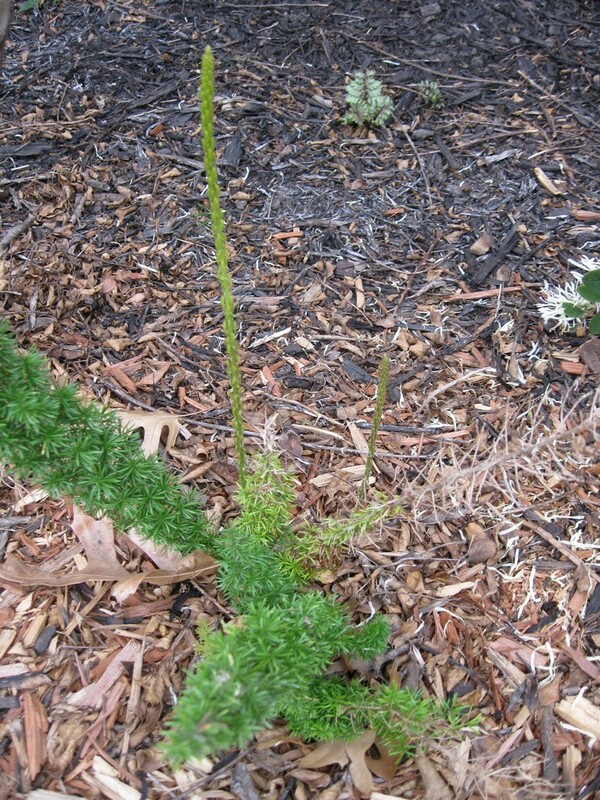 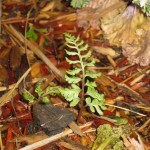 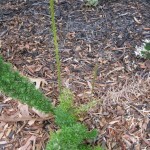 The foxtail ferns did not die back down into the ground this due to the mild winter weather. 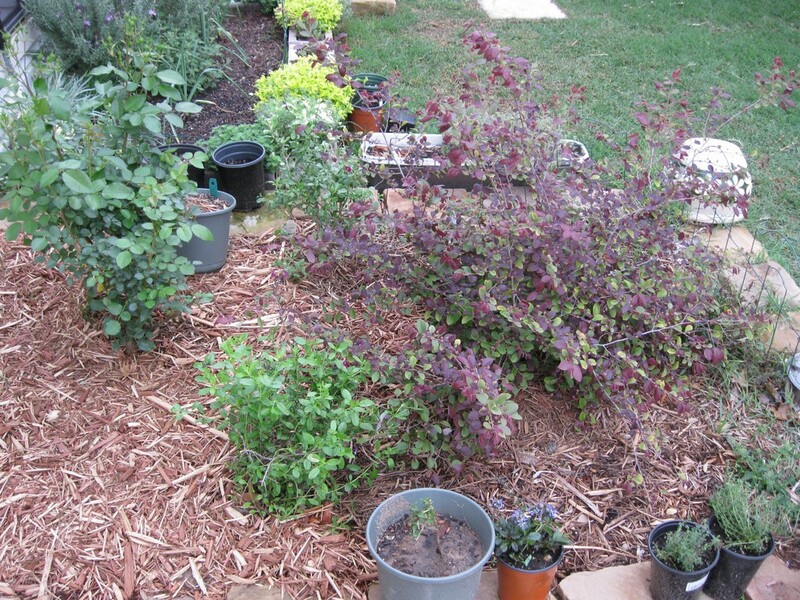 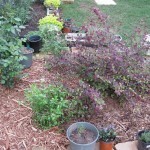 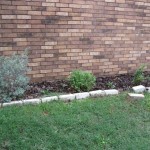 It was pleasant to see them provide some greenery and vertical shape to the shade bed. 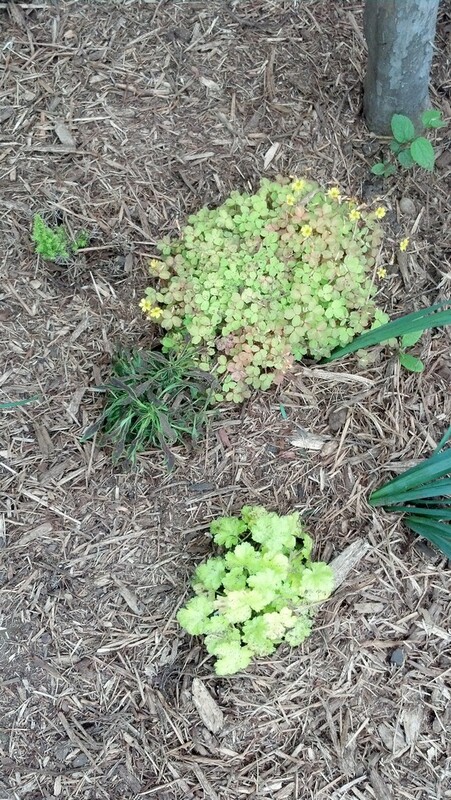 Check out the japanese painted fern behind the foxtails! 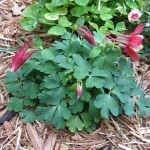 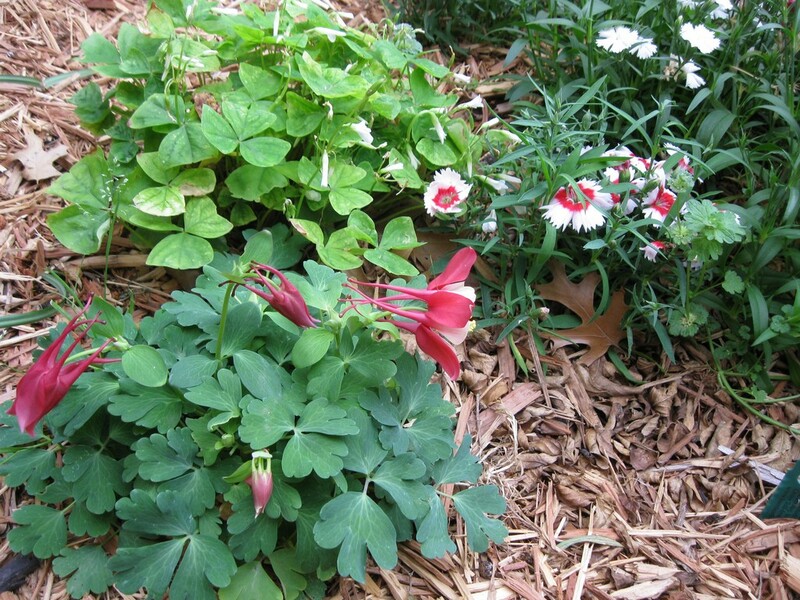 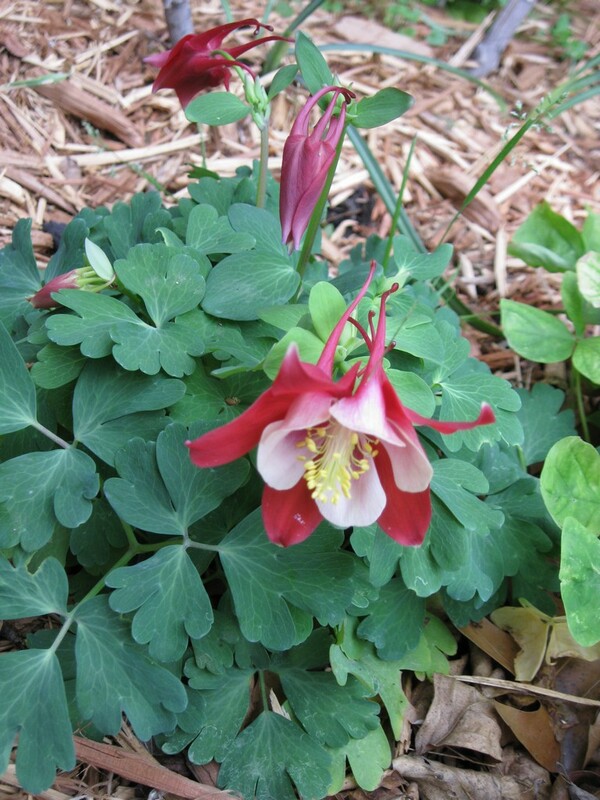 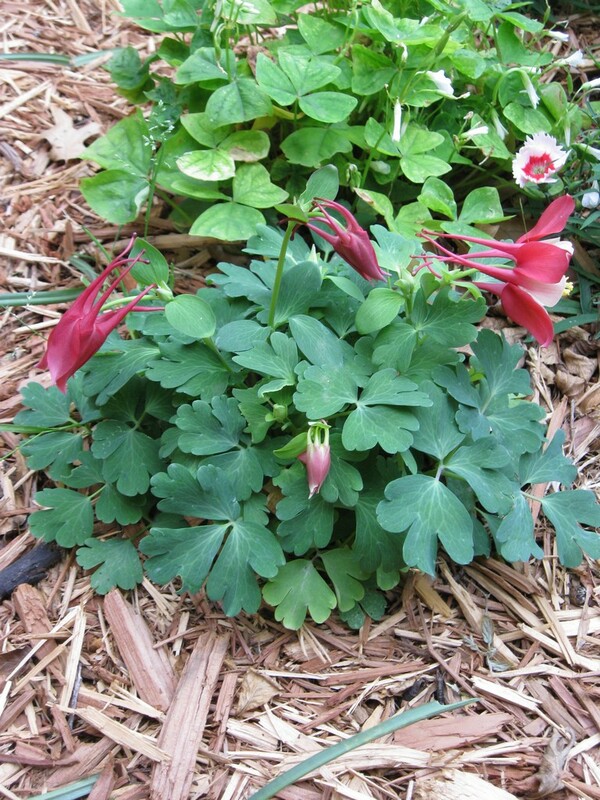 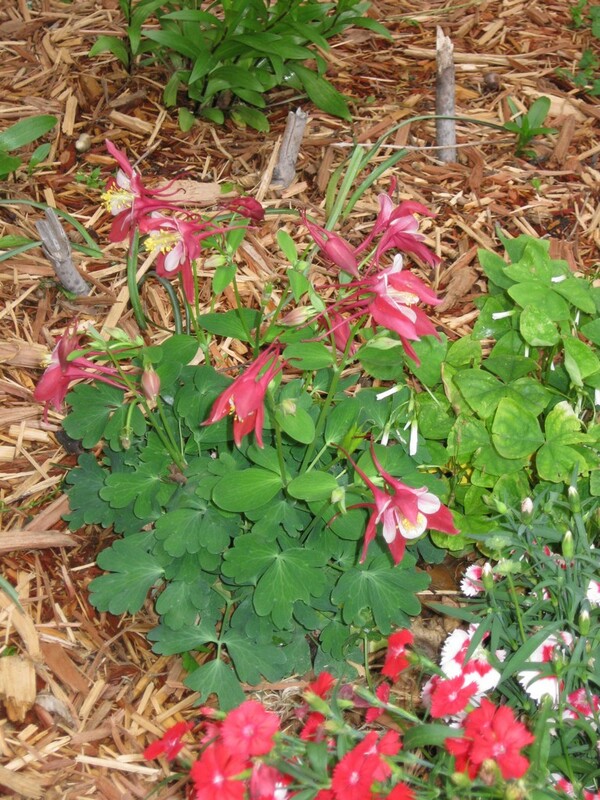 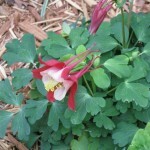 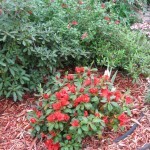 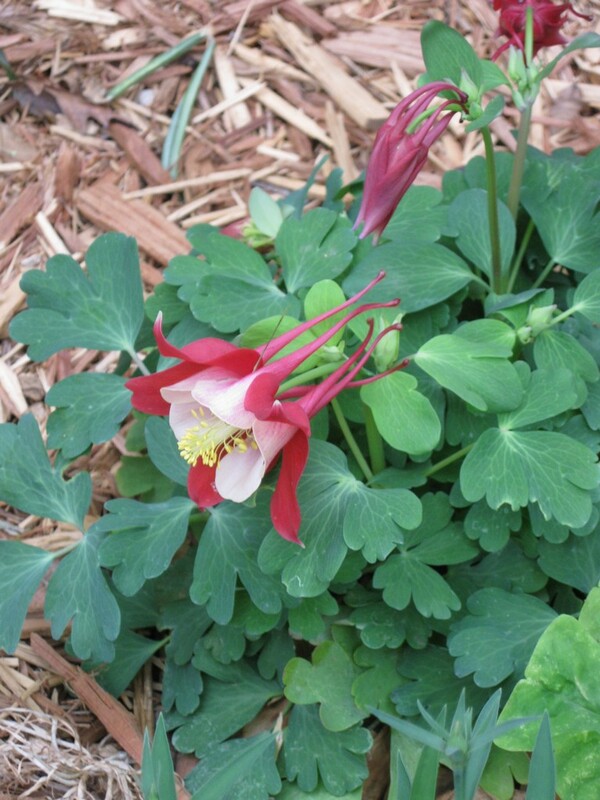 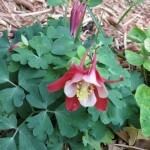 The lily bed would like to welcome our newest bloomer: origami red and white columbine. 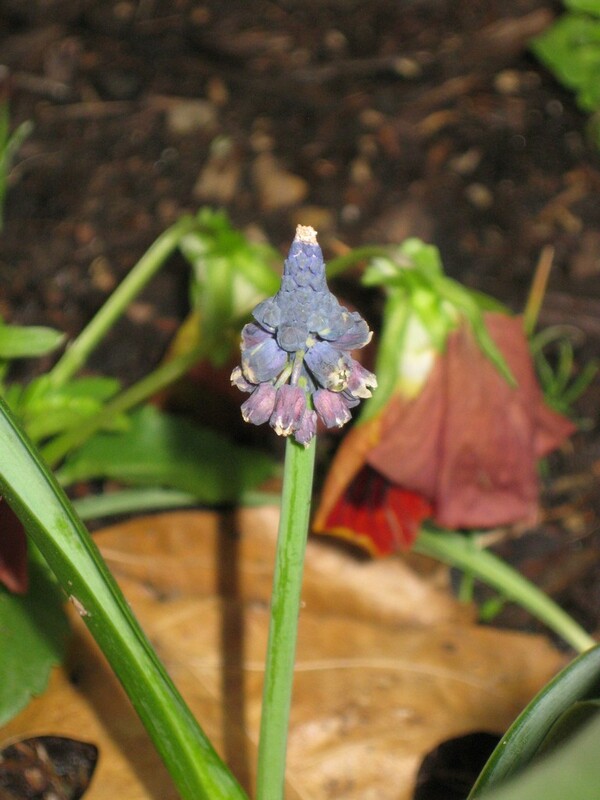 Beautiful spurred flowers are blooming on this one specimen. 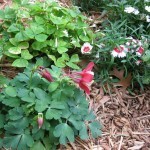 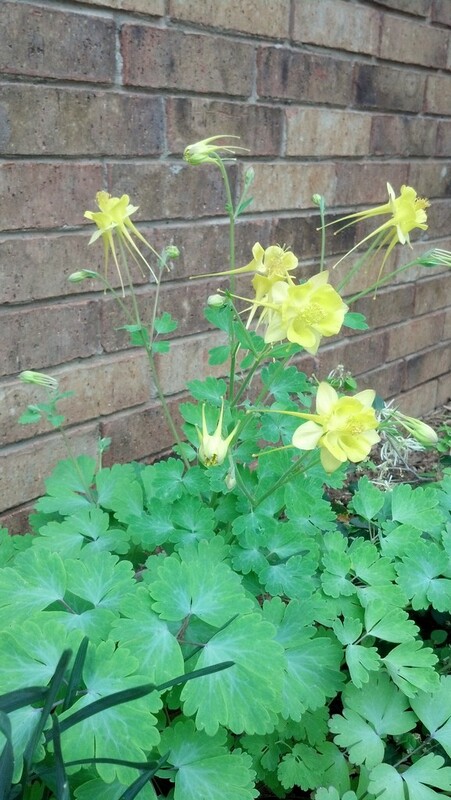 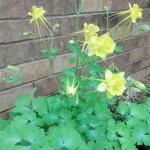 The other columbine is looking rather straggly but at least it endured summer and winter. 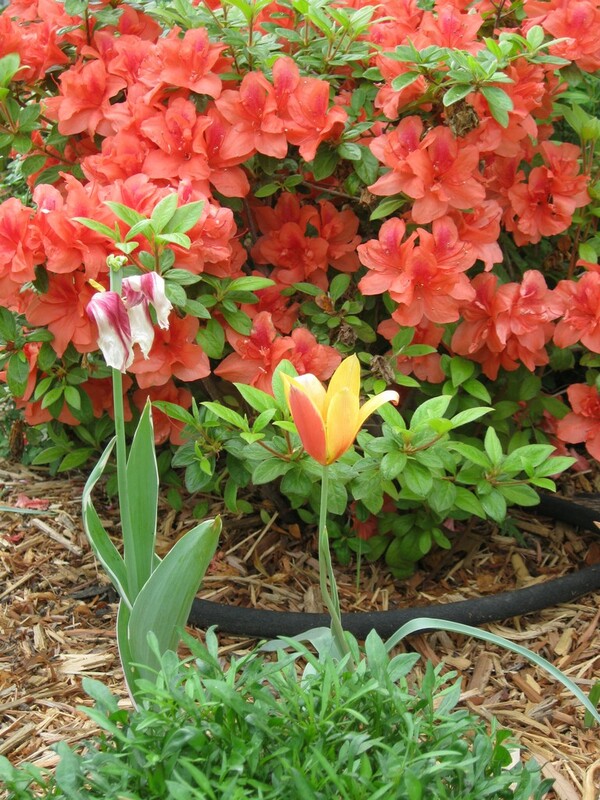 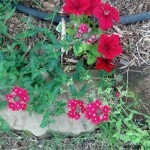 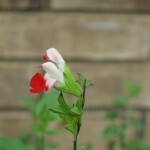 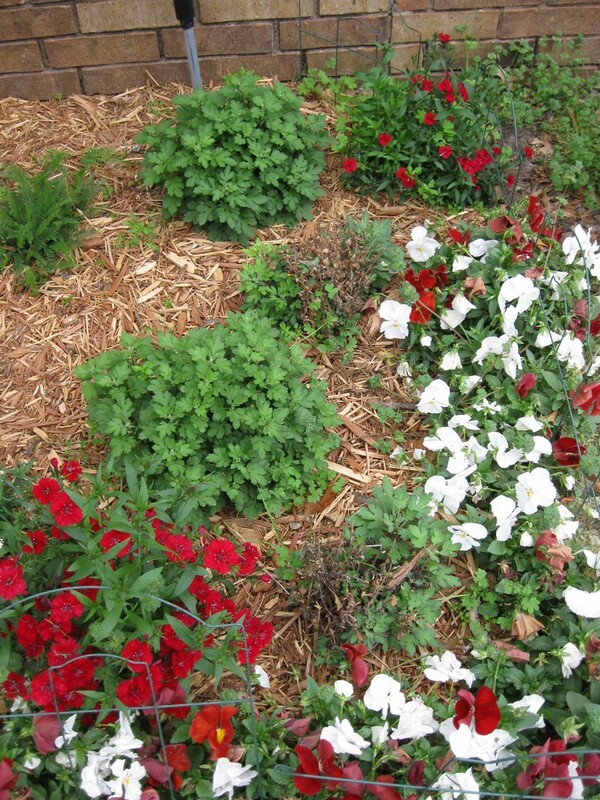 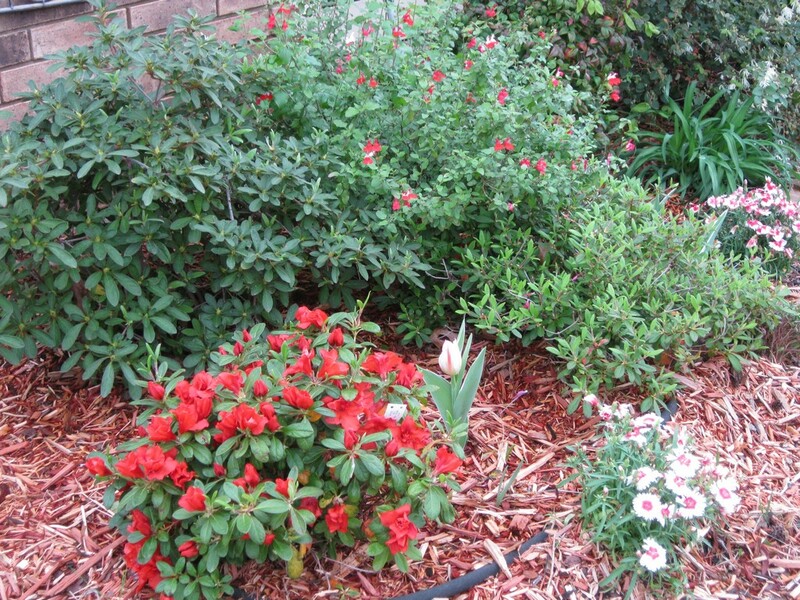 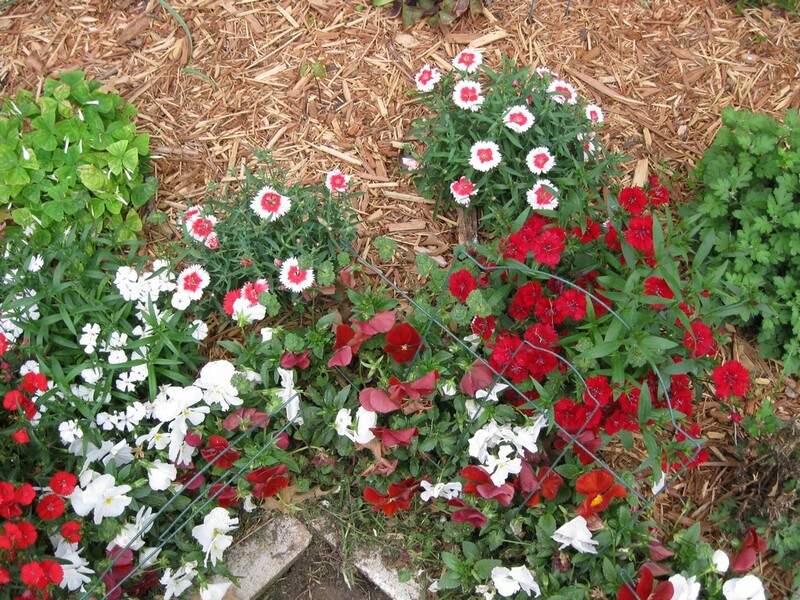 The colors are synching with the red-and-white theme of the neighboring dianthuses and pansies. 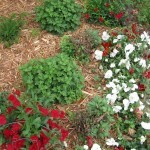 I hope in a future season, we will see some lush foliage and growth show off this bed. 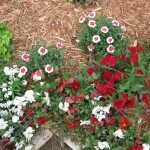 For example, the orange and white mums appear to be bulking up in anticipation. 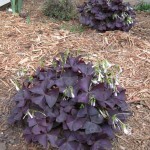 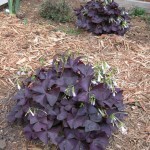 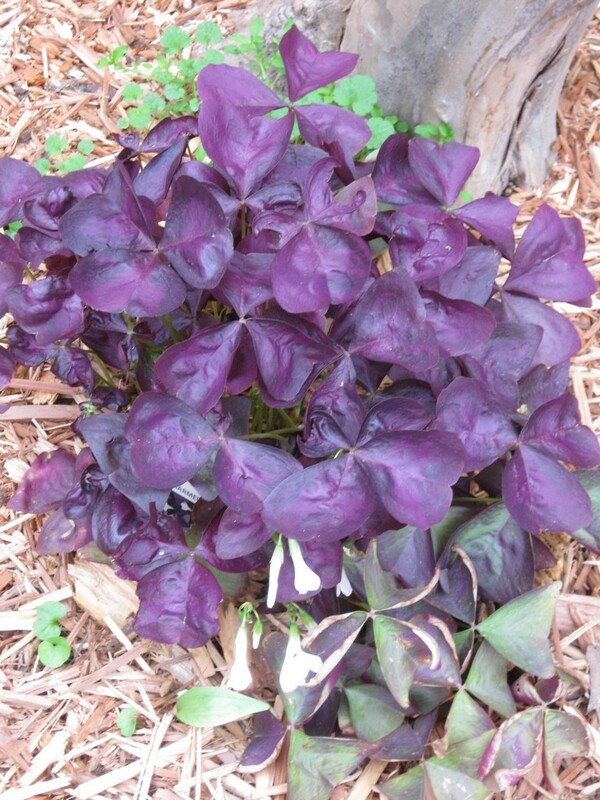 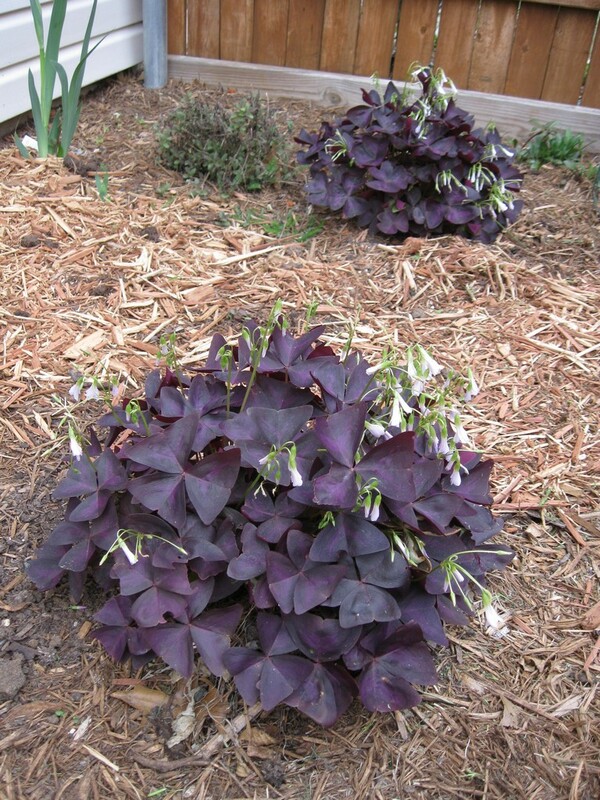 The Charmed Wine oxalis appear to be a little shy coming out of winter; they don’t show off as many blooms as the neighbors in the blue bed, and they are half the size. 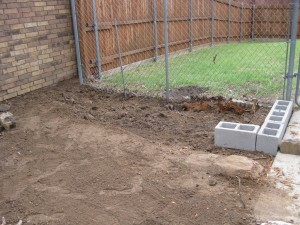 I filled in the new garden bed this morning and tried to level the ground up to the bed at the same time. 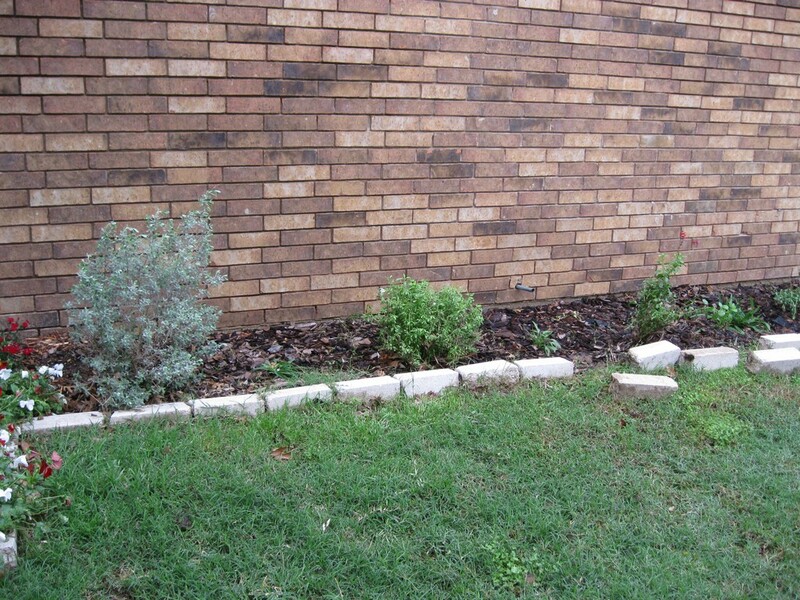 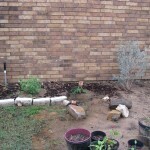 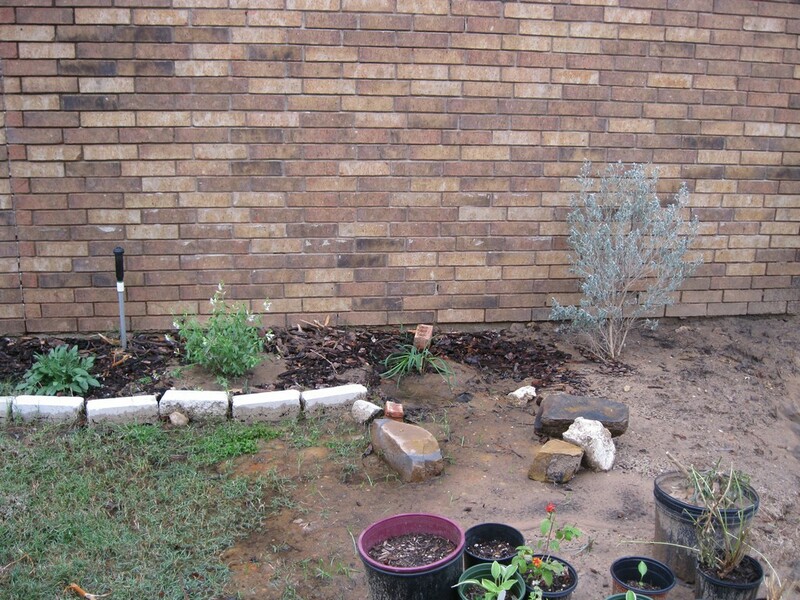 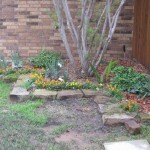 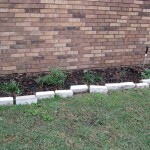 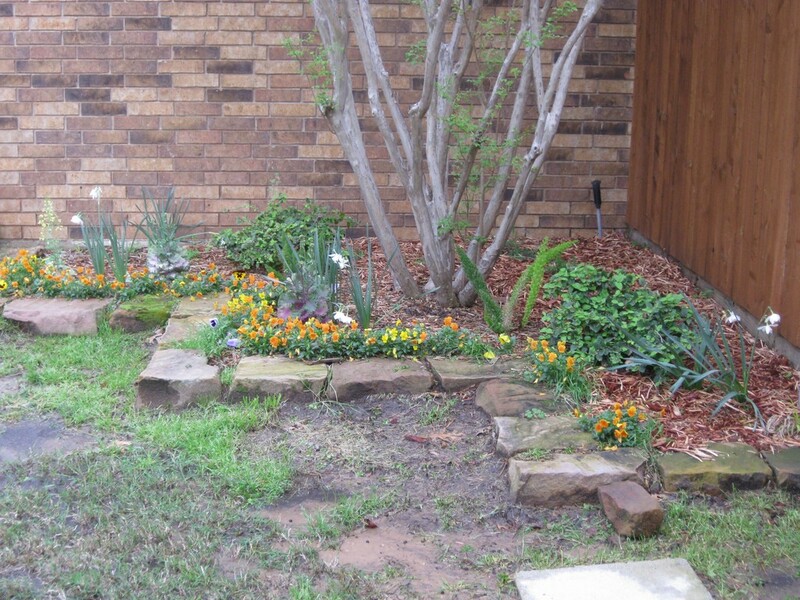 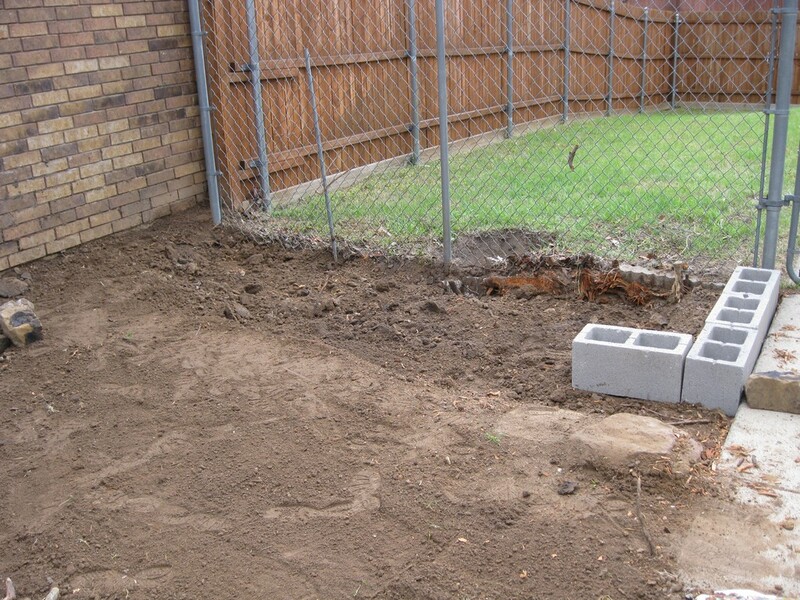 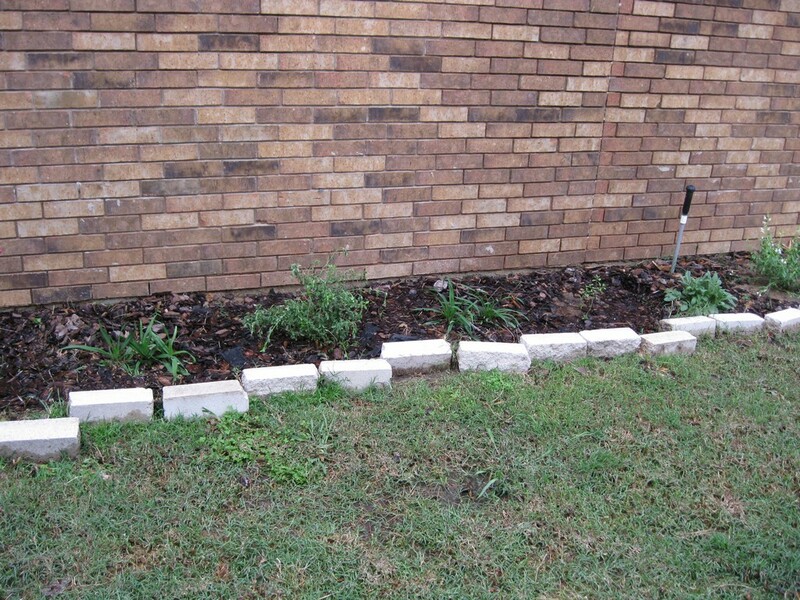 We’ll be requiring some good soil to fill in the rest and start arranging the cinder block edge. 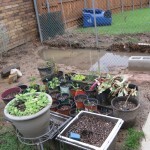 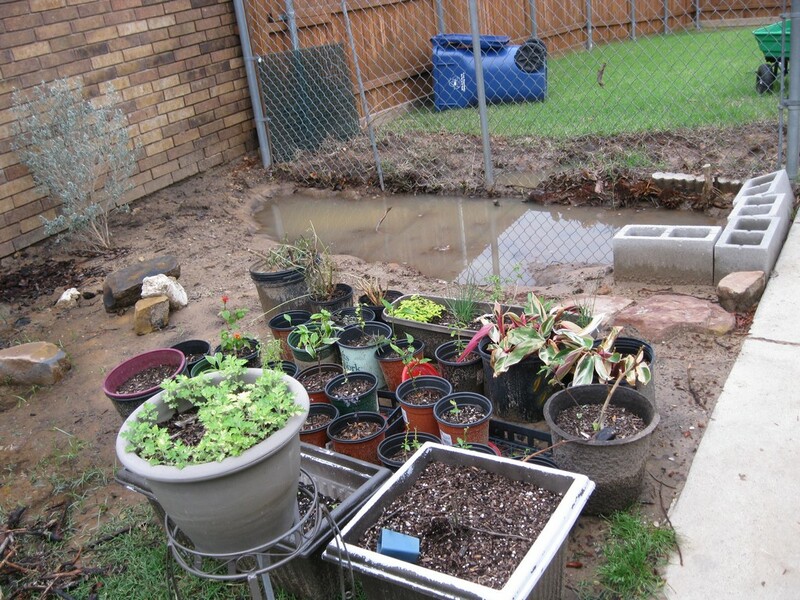 Now if it would stop raining/sprinkling long enough for us to get some garden work done!